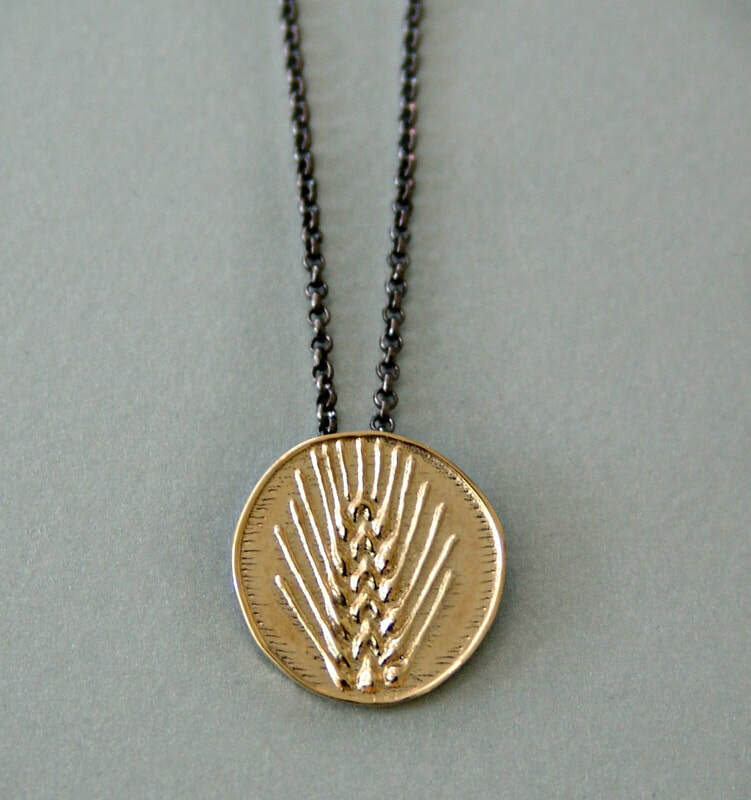 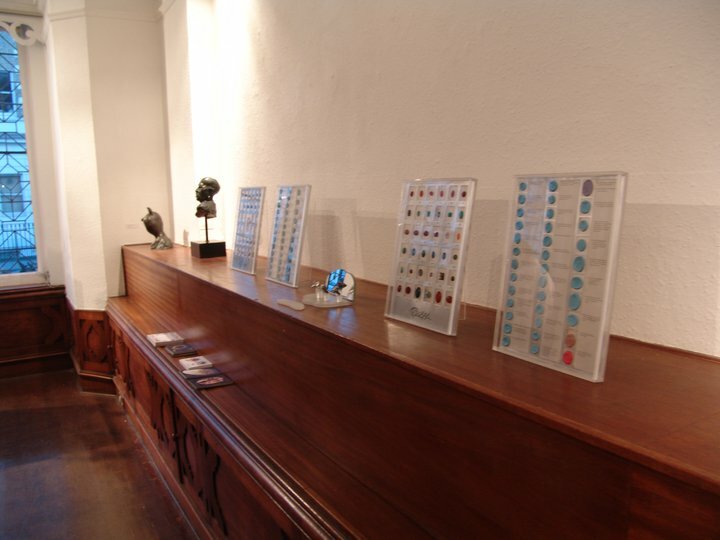 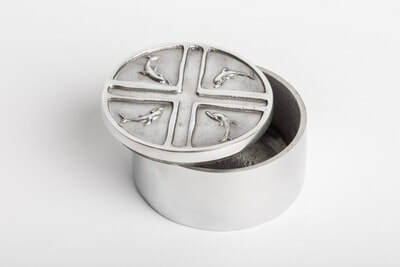 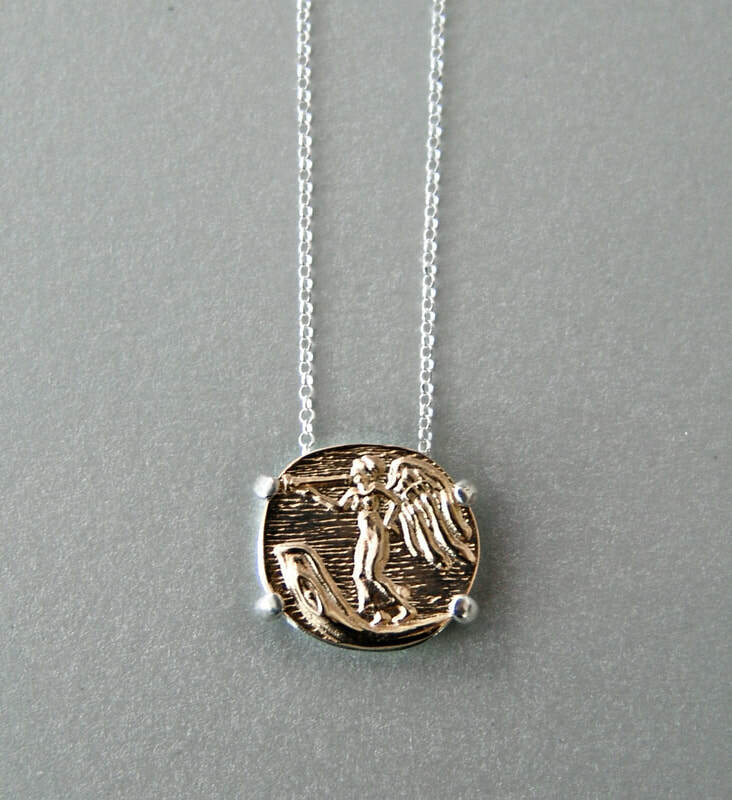 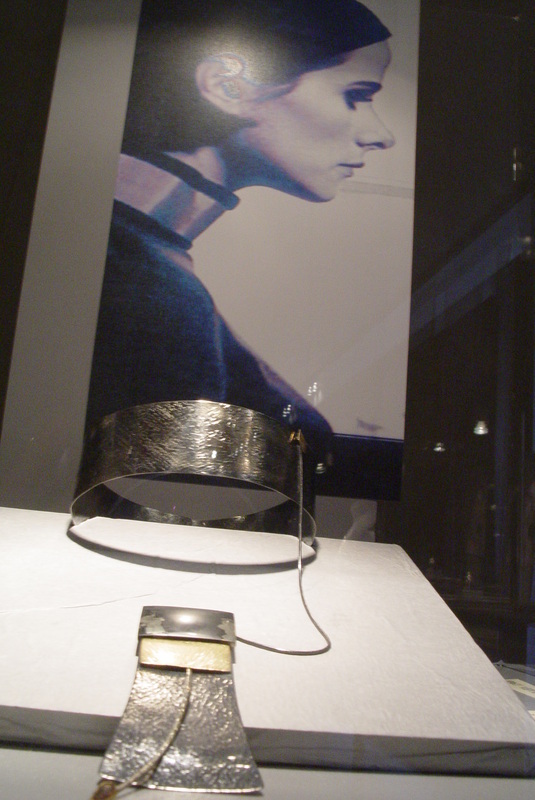 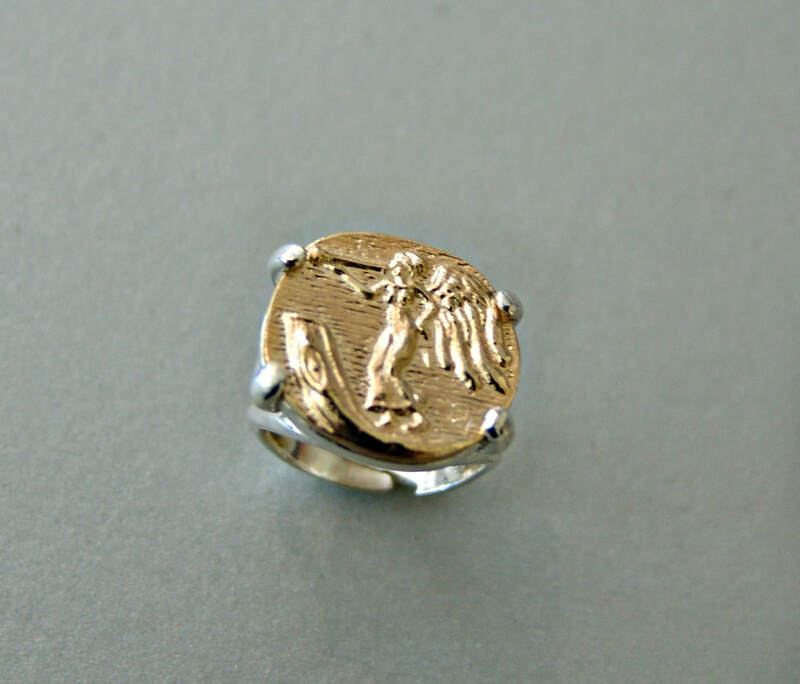 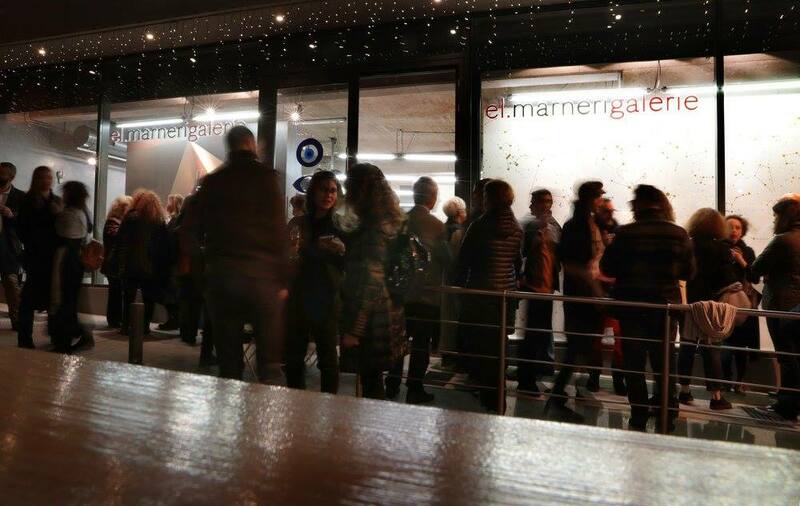 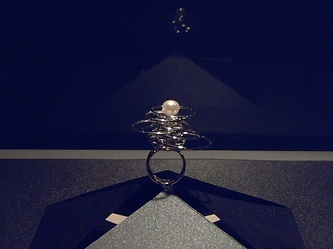 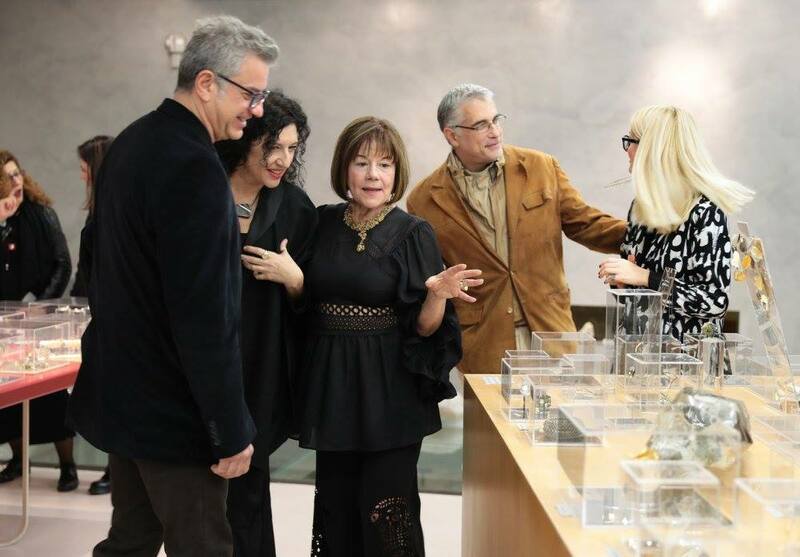 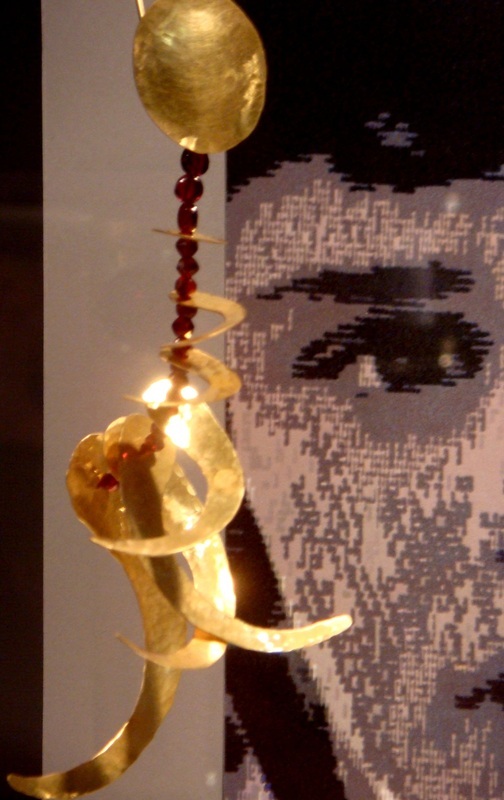 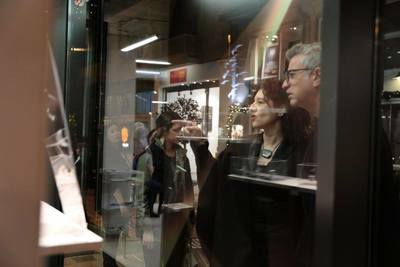 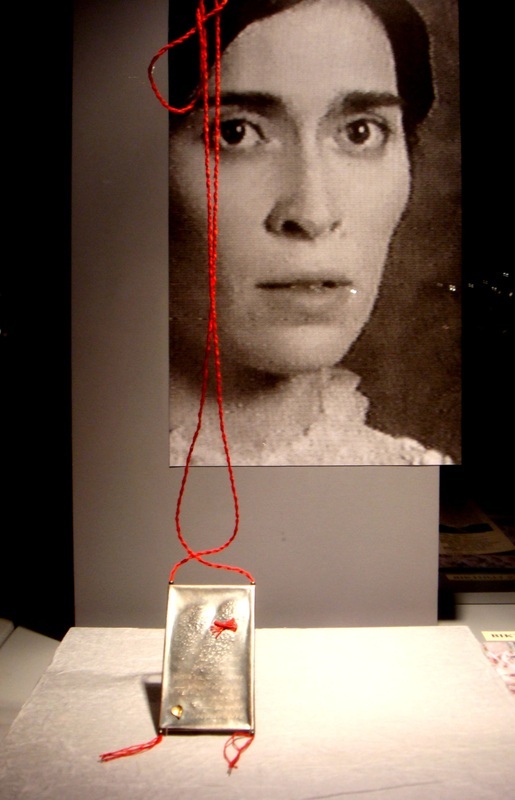 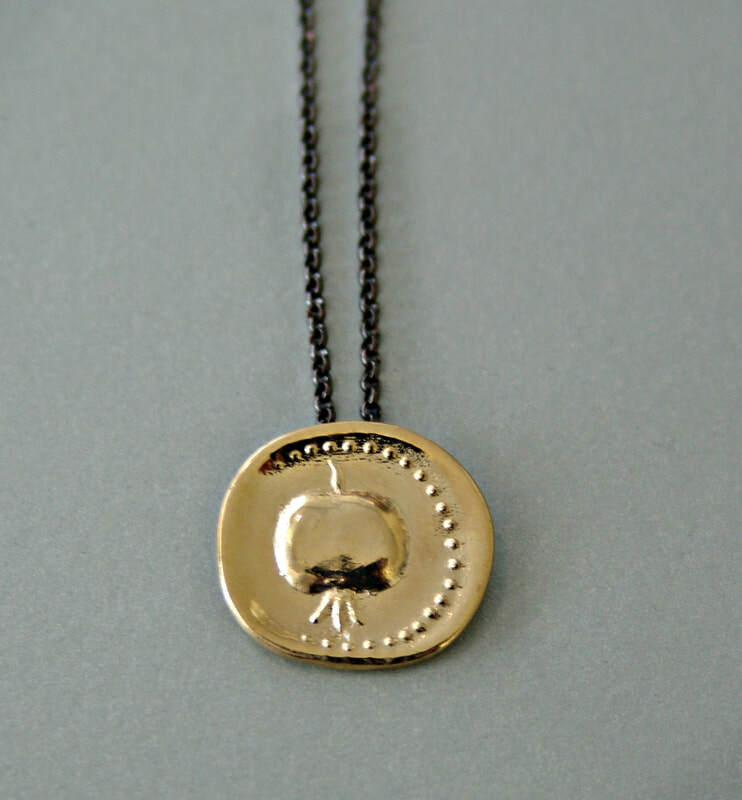 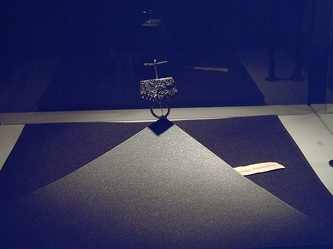 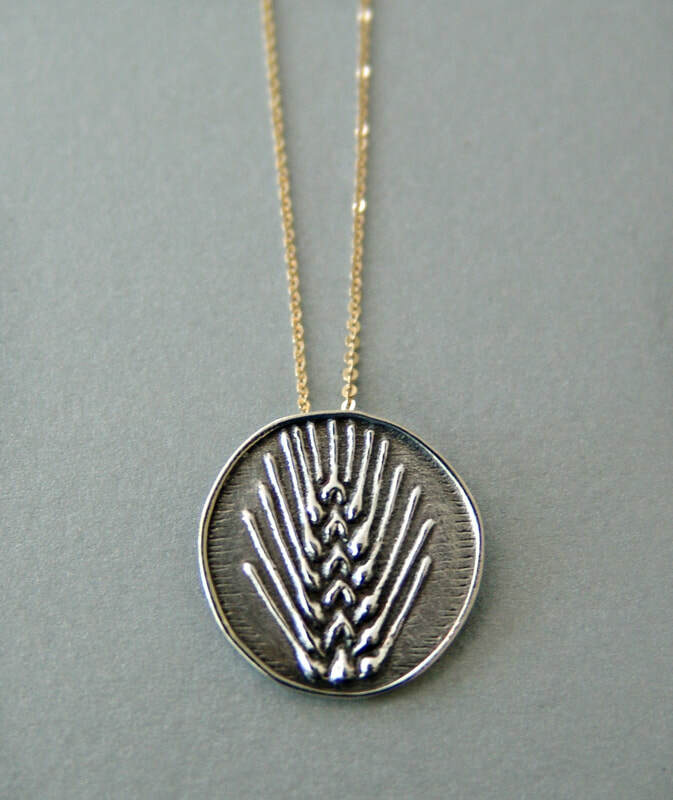 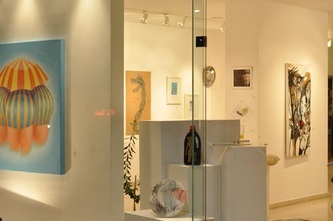 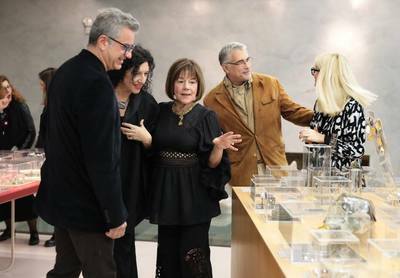 For three decades, Eleni Marneri Gallery has been showcasing and communicating the work of artists and designers which is identified by originality and innovation on jewelry. Eleni Marneri, after thirty years of expertise in the field of jewelry, reintroduces us all to this beautiful world in her new gallery under the sacred rock of the Acropolis. 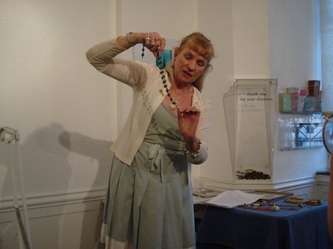 energy and also plays a predominant role in the field of Numerology. 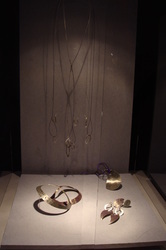 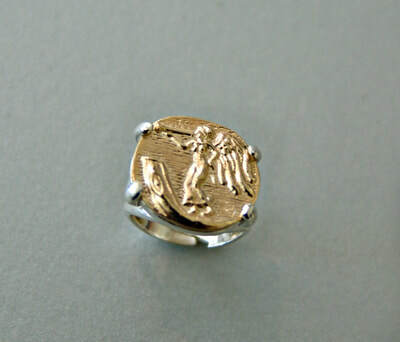 It also signals the gallery's three decades in the jewelry scene. During the exhibitions, various workshops, performances, art history and gemology lectures by experts will take place while designers will be given the chance to comment on the process of jewelry-making from a personal standpoint. 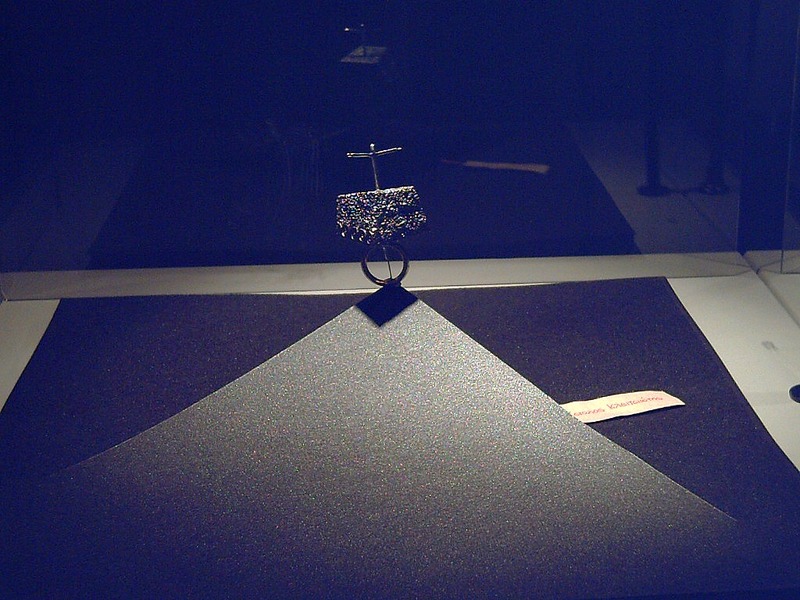 The 2nd exhibition will bring us closer to the long history of metalworking throughout man's history initiating a dialogue with metals. 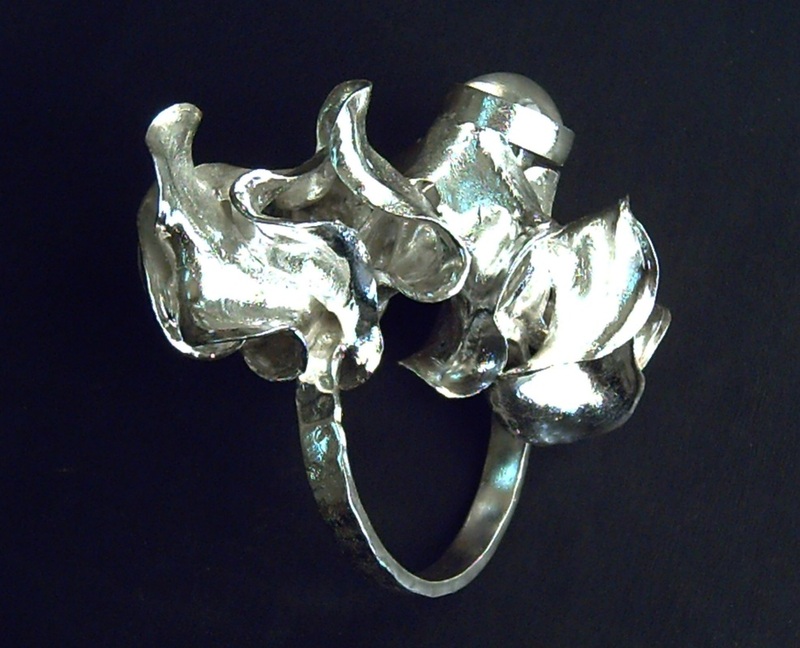 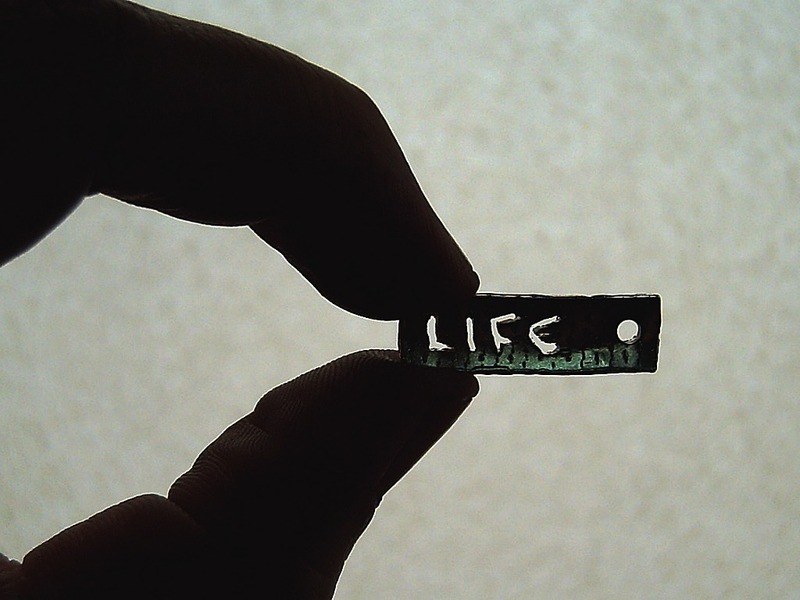 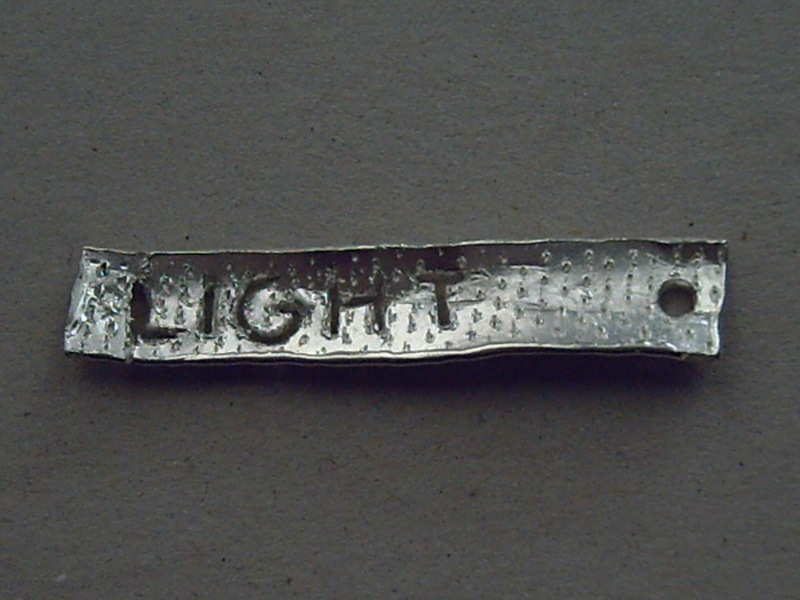 Designers will transform metal into precious objects that adorn and protect the bearer. 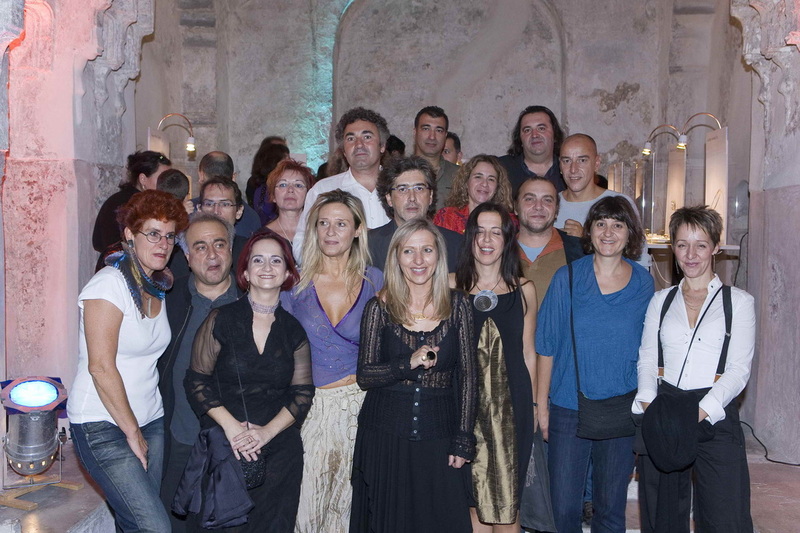 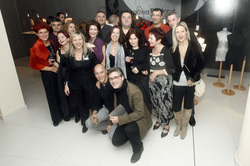 Maria Apostolopoulou, Vassilis Vassiliou, Marianne Cornelius & Petra Hauser, Stella Deligianni, Laura Forte, Sofia Zarari, Artemis Zafrana, Thomas Thomidis, Huffy, Iosif Iosifidis, Nikos Karakostas, Rallou Katsari, Pinelope Kallirosi, Apostolos Klitsiotis, Vally Kontidis, KK Jewelry Lab by Katerina Kouloubourou, Lambros & Semeli, Marialena Leodaraki, Maria Mastori, D-olium jewels, Sarina Beza, Margarita Myrogianni, Potnia, Giasemi Rapti, Elsa Sarantidou, Yannis Sergakis, Aliki Stroumpouli, Alexis Tetsis, Fotini Psarouli. Τhe first exhibition will be held in November and is dedicated to the fascinating world of precious stones where designers will invite us to a journey that will reveal the secrets behind gems. 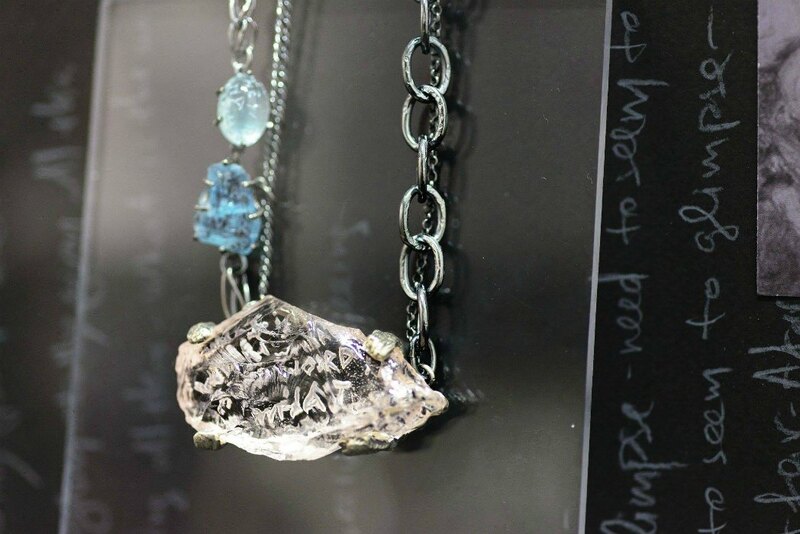 They will explore the power and the properties, the beauty, the value, the strength as well as the meaning of each stone when it coexists with other materials to form a jewelry. 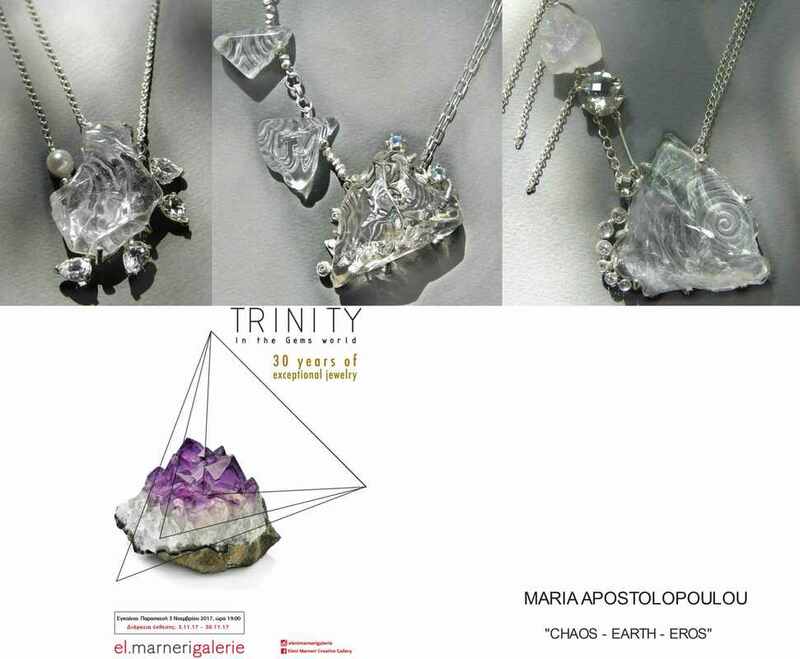 Maria Apostolopoulou, Elena Votsi, Afroditi Goula, Marianne Cornelius, Sarah Cossham, Tania Drakidou, Elena Kougianou, Sissy Koukeri, KK Jewelry Lab by Katerina Kouloubourou, Marialena Leodaraki, Mary Margoni, Maria Mastori, Dolly Boucoyannis, Elsa Sarantidou, Maria Psarianou, Fotini Psarouli, Katerina Psoma. 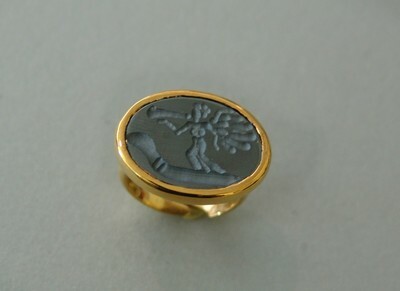 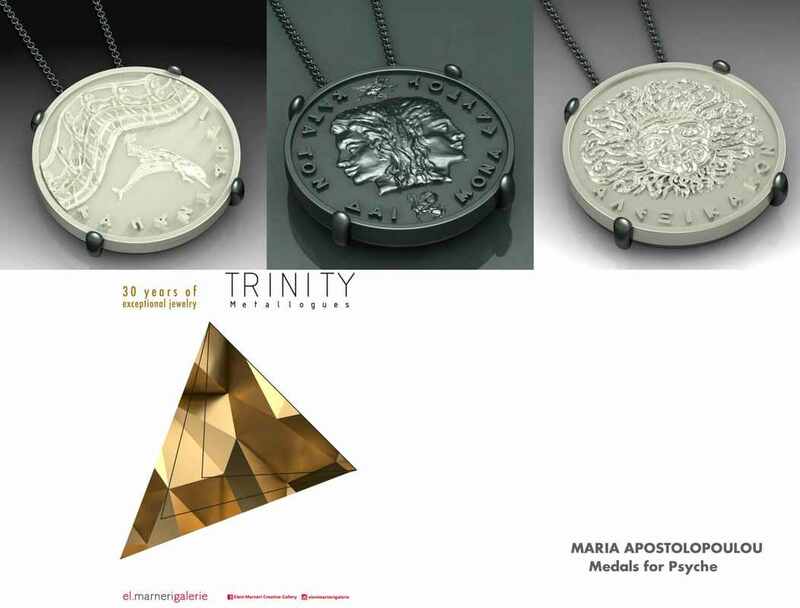 "COINS" , the New Jewellery and Object Collection designed by Maria Apostolopoulou exclusively for the exhibition "MONEY Tangible symbols in ancient Greece". The Exhibition will be held from November 2017 to April 2018 and will present to the general public extraordinary samples of the ancient coinage, mainly from the Alpha Bank Nuimismatic Collection. 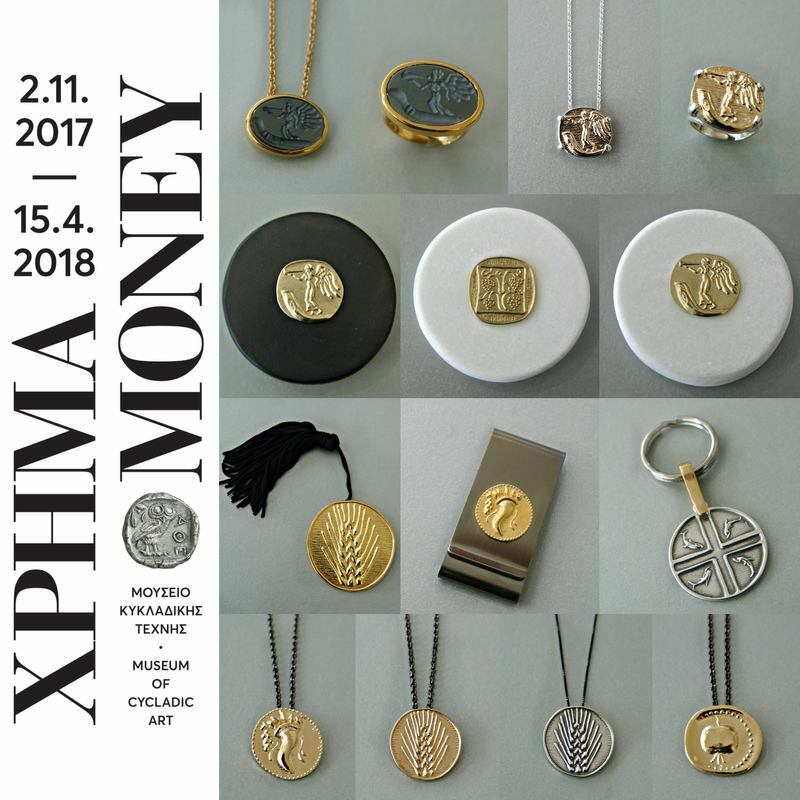 >> The Exhibition theme relates to the diverse references and readings of the symbols depicted on coins, from the late seventh century BC into Roman times. The coin is, first and foremost, man’s basic medium of transaction, the means by which people cover their everyday needs and the State makes payments and honours its monetary obligations. 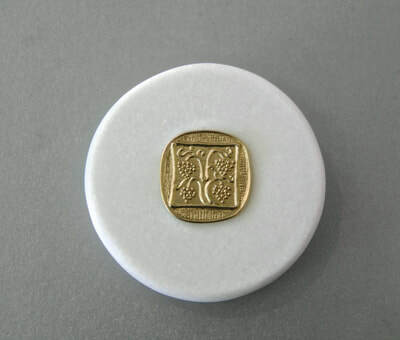 >> Ancient coins, however, are not merely media of transaction; they are of themselves tangible symbols, symbols that are literally handled, that are read, that are comprehended. 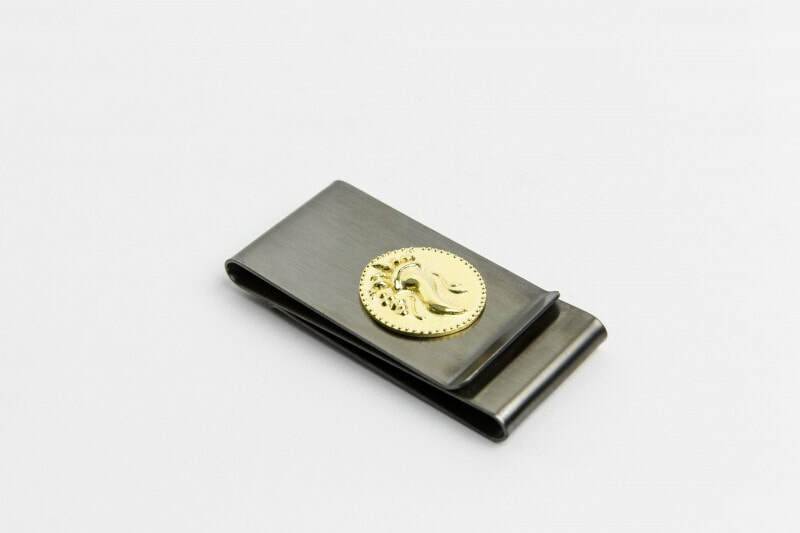 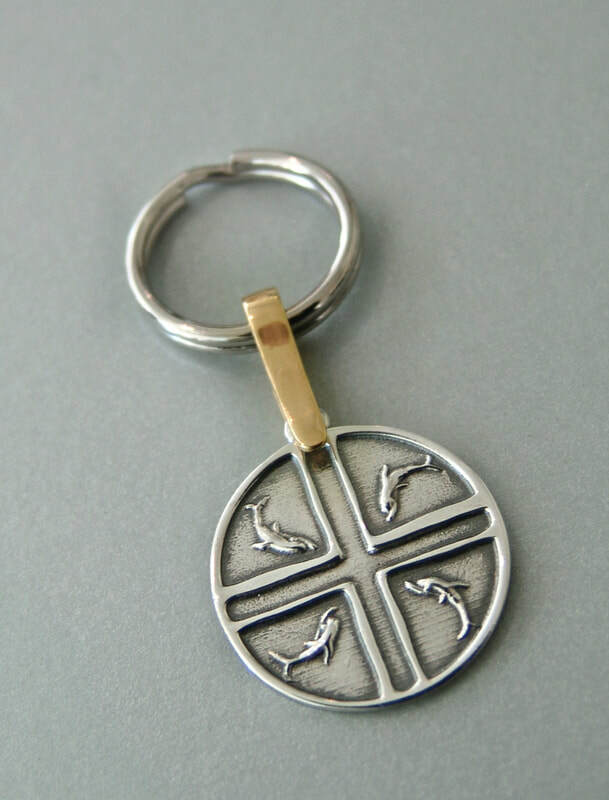 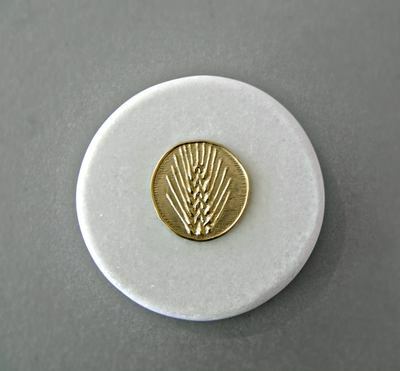 That is why the representations they carry provide important information –historical and other– which is linked with the place and the authority that issued the coins. 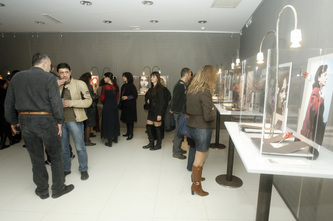 >> In the eight thematic units of the Exhibition, alongside the exquisite specimens of numismatic art a selection of other objects (statues, reliefs, vases, figurines, inscriptions) from museums in Greece and abroad will be displayed, the iconography and the references of which document scientifically the images imprinted on the coin flans. Victory or Nike was the personification of contest’s successful outcome. She is depicted as a young female figure with wings that symbolize the velocity that she sped to bring the joyous message of victory, while holding a salpinx and a trophy from the battle. 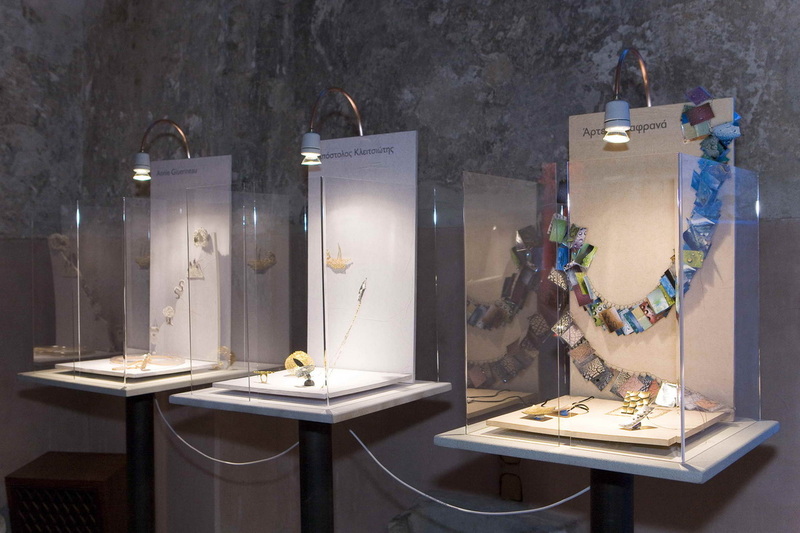 As part of its winter program, the Ilias Lalaounis Jewelry Museum presents ‘New Territories,’ a temporary exhibition showcasing the creations of 50 distinguished and emerging Greek jewellery artists. 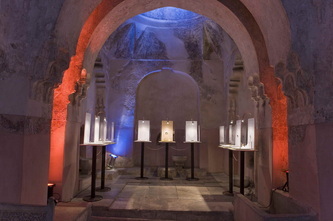 The jewels will be on display for the first time and highlights the developments in Greek craftsmanship as well as the international trends that have influenced the decorative arts. 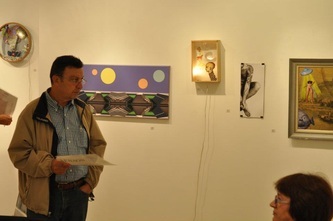 Lectures and weekly artist presentations will feature through out the exhibition. 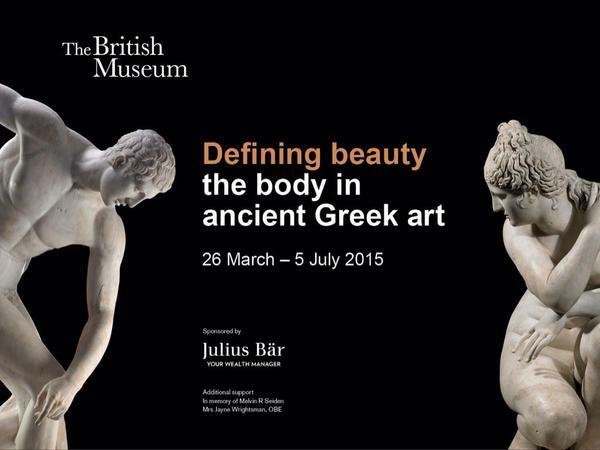 Focusing on the human body, this major exhibition allows visitors to experience the brilliance and diversity of ancient Greek art. The remarkable works of art in the exhibition ranges from abstract simplicity of prehistoric figurines to breathtaking realism in the age of Alexander the Great. These works continued to inspire artists for hundreds of years, giving form to thought and shaping our own perceptions of ourselves. 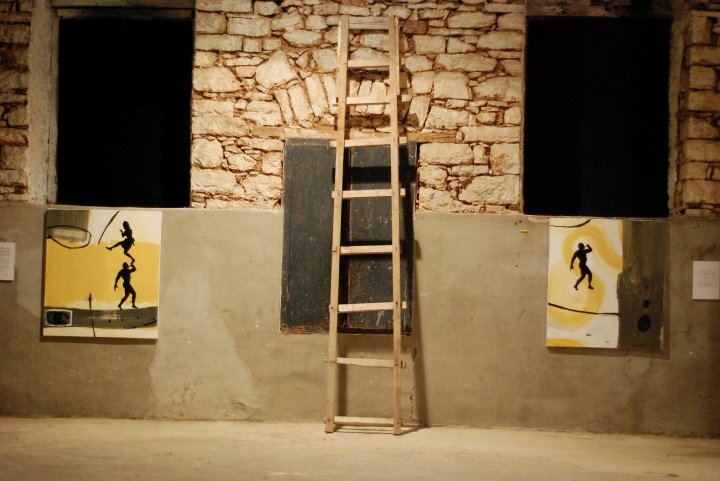 How did ancient Greeks care for their nutrition and bodies? 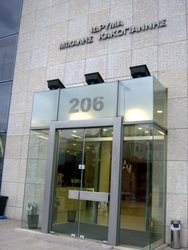 How did they address the issue of public health? 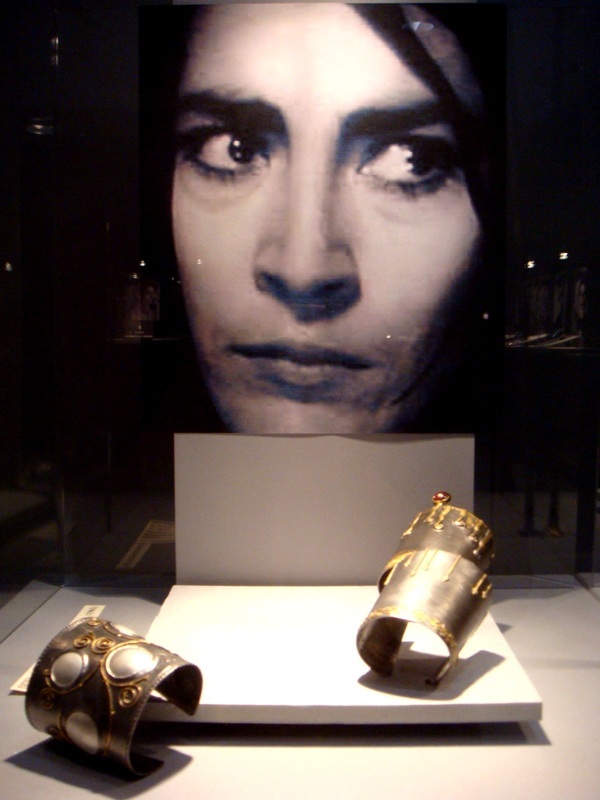 What would an athlete do if he got injured 2.500 years ago? Were there any surgical tools? 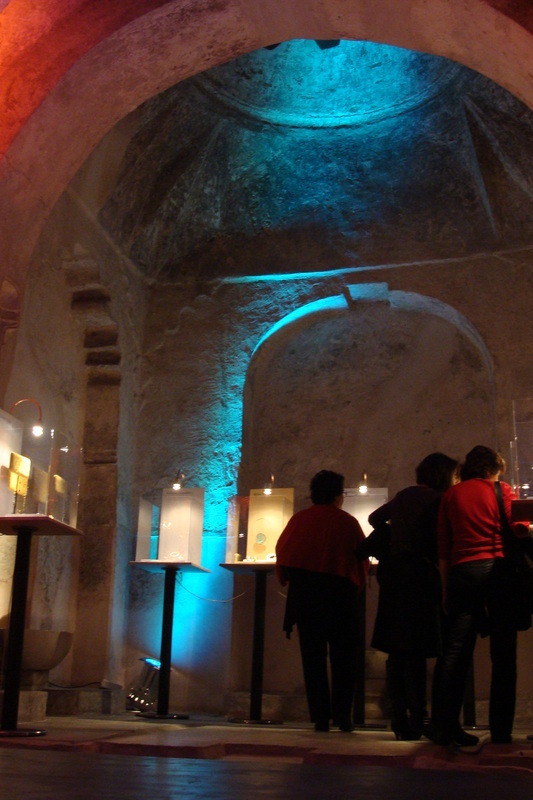 How did they use opium and other pharmaceutical substances and herbs? From the dawn of its existence, humanity has strived to improve all aspects of living conditions. Achieving and maintaining good health, seeking to understand the causes of diseases and, mainly, searching for solutions to fight and treat illnesses have been a primary concern and interest throughout all periods of civilization. 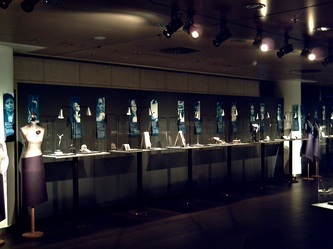 The Museum of Cycladic Art presents the major archaeological exhibition Hygieia: Health, Illness and Treatment from Homer to Galen, focusing on the universal subject of Health, providing an overview of the evolution of ancient medical practices: the transition from magico-religious healing practices to rational, scientific medicine. 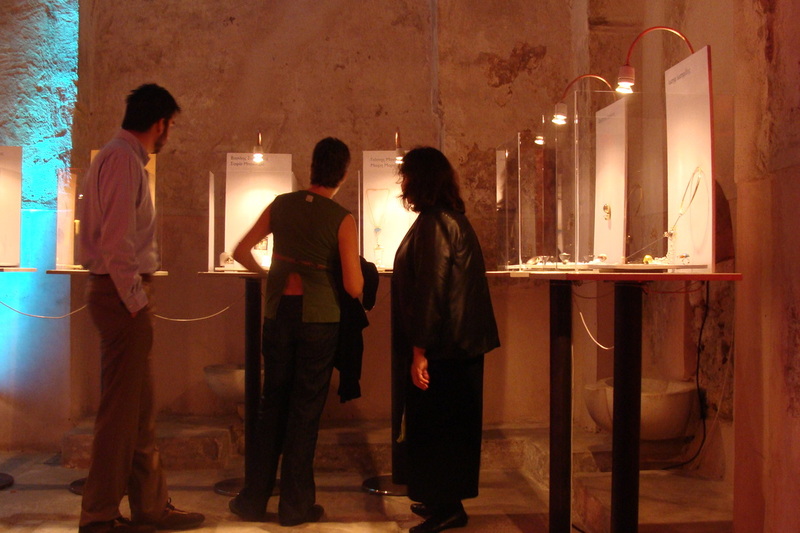 The exhibition presents approximately 300 artifacts with the participation of 41 international museums, including the Louvre, the British Museum, the National Archaeological Museum of Athens, the Musei Capitolini. 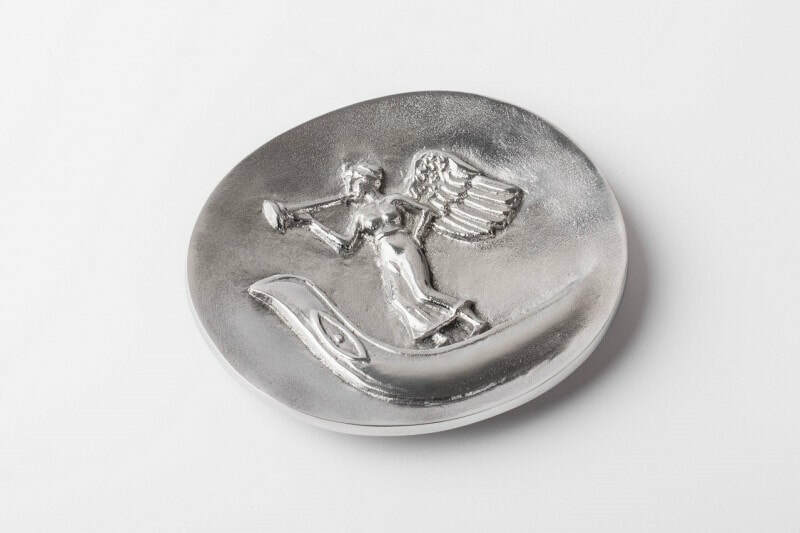 Our earliest literary sources for the history of Greek medicine are the epic works of Homer which clearly reveal that the Greeks of the Heroic Age linked sickness and disease with the supernatural, regarding them as manifestations of the wrath of the gods. To appease the gods, they employed prayers, purifications, animal sacrifices etc. 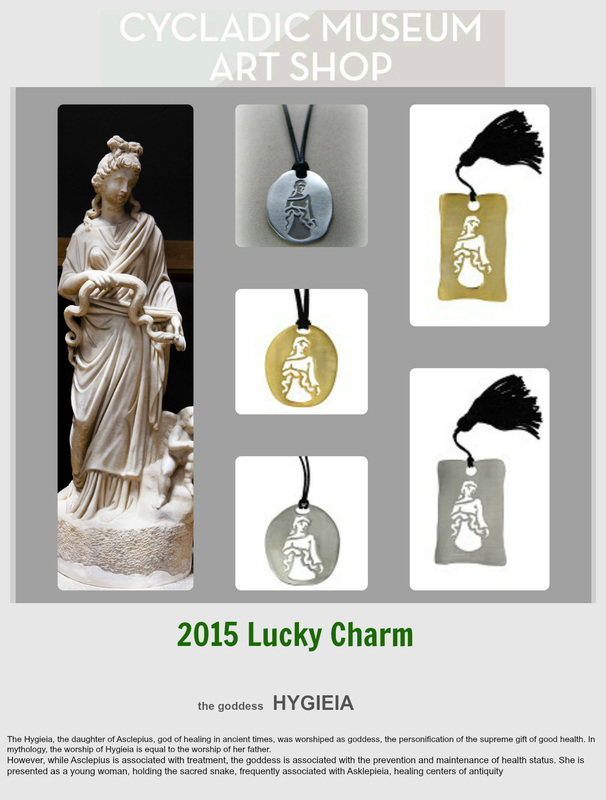 Even the idea of health (Hygieia) was personified as a wonderful goddess usually accompanied by a snake, the symbol of therapy. 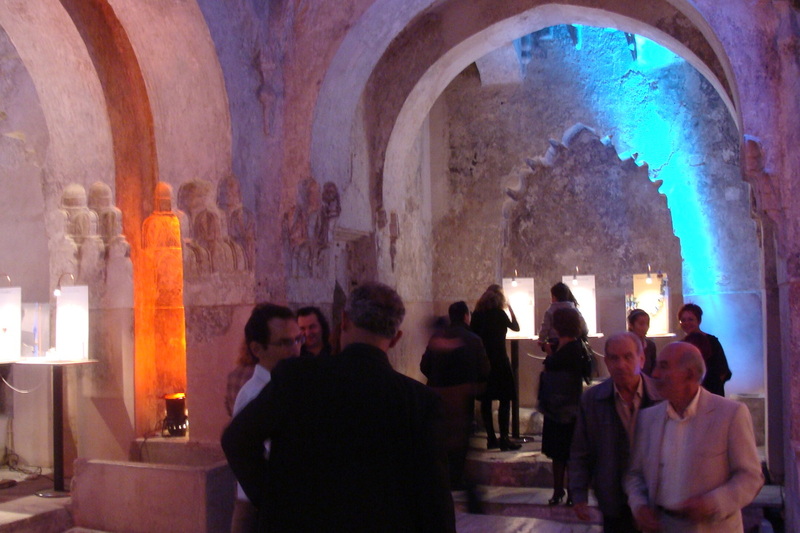 By the late 6th century BC, however, philosophy came to exercise a powerful influence upon the development of medicine. 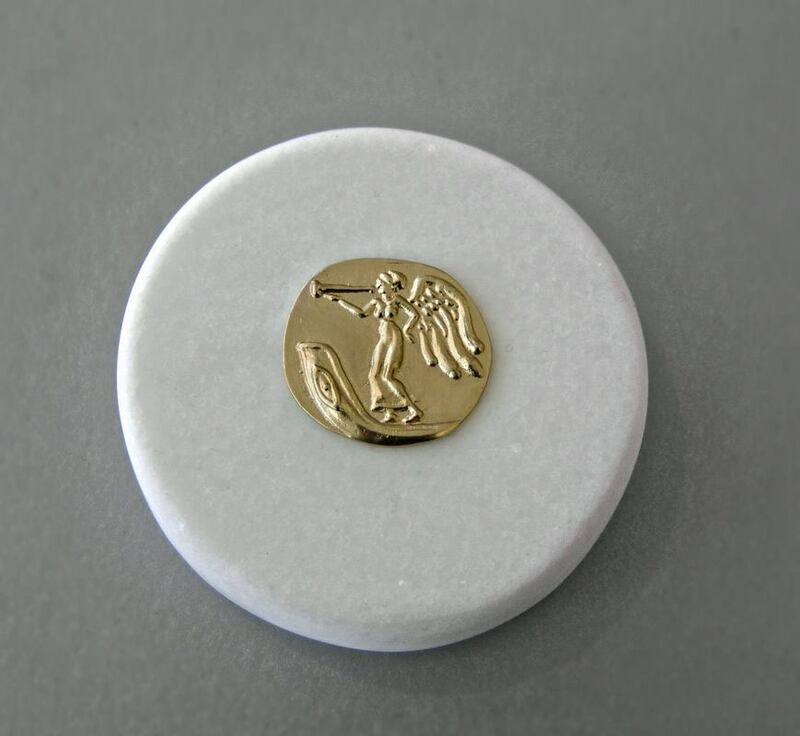 Hippocrates and the classical Greeks were the first to evolve rational systems of medicine free from magical and religious elements, realizing that maintaining good health and fighting disease depend on natural causes. 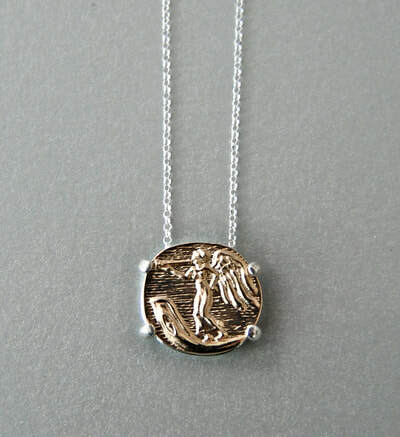 Asklepios, the son of Apollo and Koronis, was the Greek god of healing. He is shown leaning on a stick with a snake, coiled around it. The snake, being a symbol of renewal because of its ability to change its skin, became the god’s sacred animal. 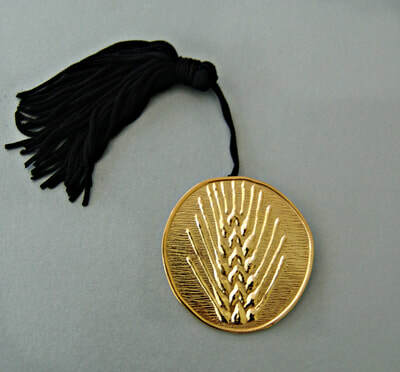 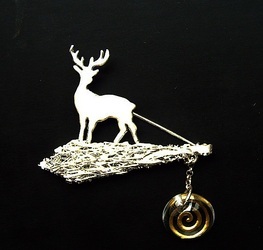 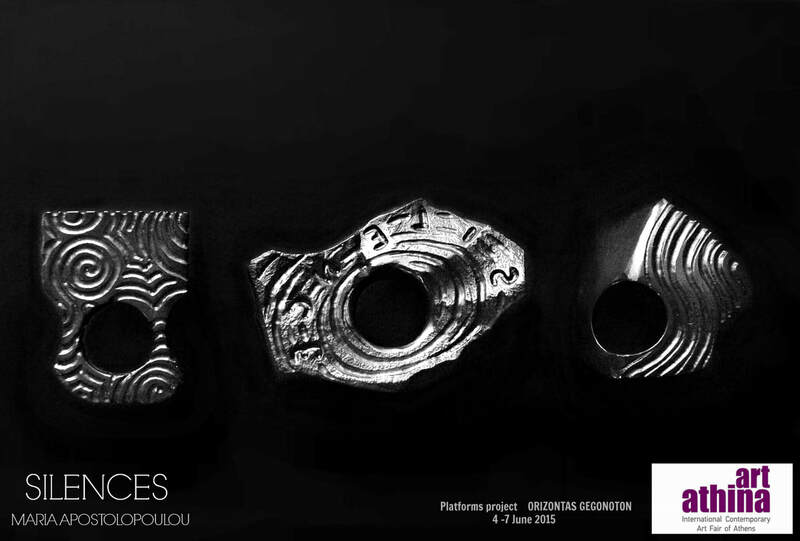 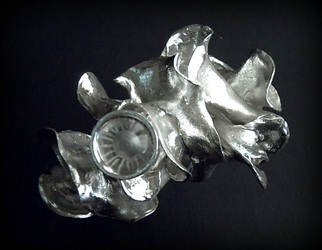 The Association of Greek jewellery designers “Jewellery Art Workers” (J.A.W) is happy to announce the Contemporary Jewellery Exhibition S Y M B O L S, from May 31 to June 9, at the Old Retorts of the Industrial Gas Museum, at Technopolis – City of Athens. 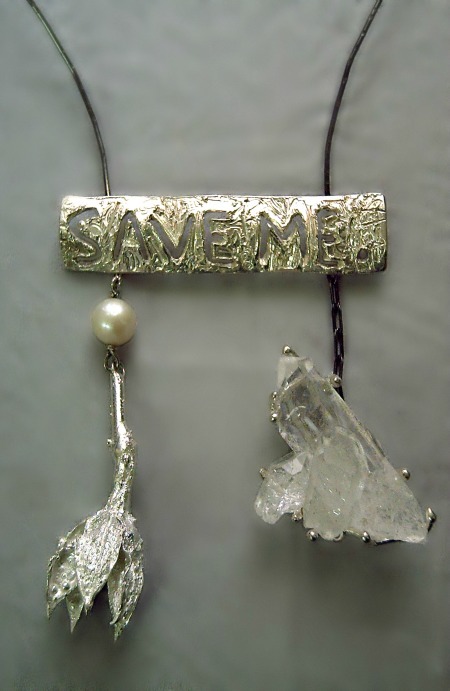 42 Artists – Distinguished Designers create a dialogue around contemporary symbolisms formulated into jewels, using various materials and mediums. Those jewels resist the ravages of time and arrive as fragments in future, carrying coded information – symbols of our times. 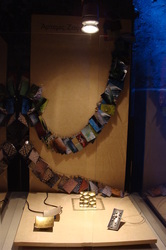 The past is reinterpreted, the present is recorded and the messages are transferred into the future, using Inspiration as guide and Art as vehicle! 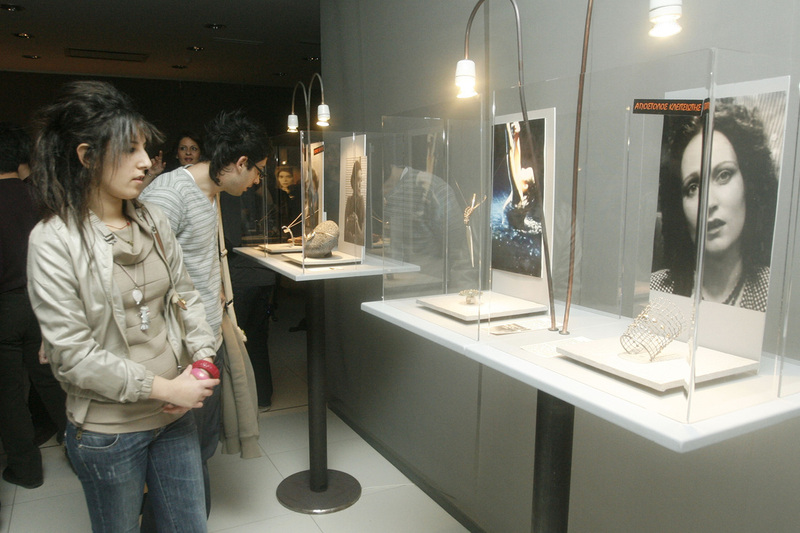 Art Video and Performances will be presented in parallel and jewellery workshops and guided tours will take place during the exhibition period. 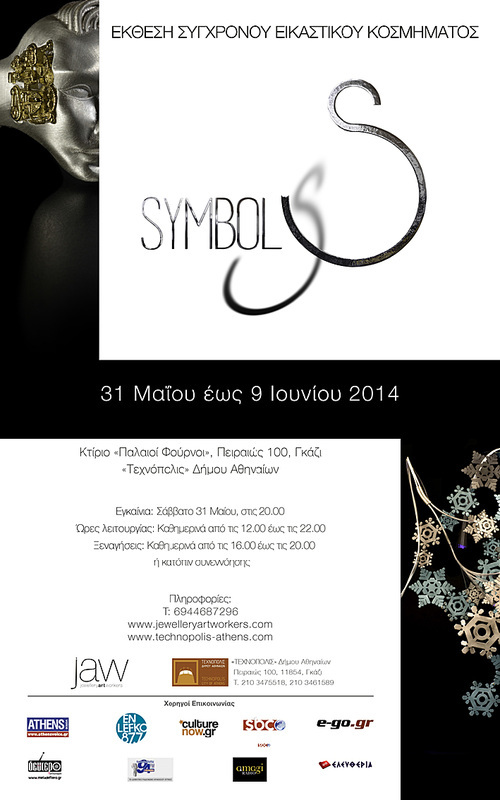 Technopolis – City of Athens: 100, Pireos str., Gazi, Athens. 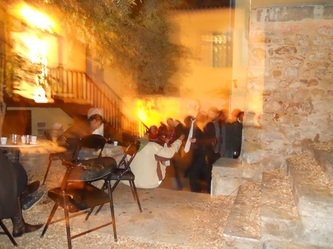 Ποια είναι τα αόρατα νησιά? Οι αθέατες όψεις του πραγματικού, οι αθέατες όψεις των άλλων, των εαυτών μας, αλλά και οι αθέατες όψεις του χρόνου που άλλοτε σκεπάζει και άλλοτε αποκαλύπτει η πάχνη του. 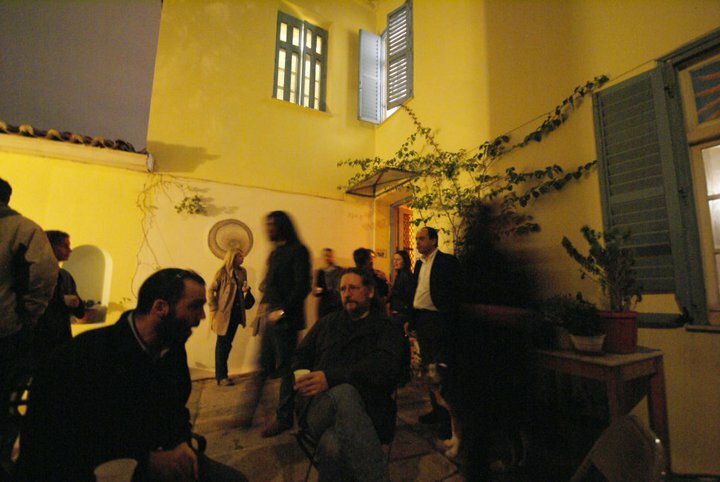 Αναστασία Καπινιάρη, Βασιλική Σοφρά, Γιάννης Κουτρούλης, Γιάννης Μπέσκος, Γιώργος Χουρχούλης, Δέσποινα Πανταζή, Δημήτρης Ευθυμίου, Κίμων Αξαόπουλος, Λίτσα Μουσούλη, Μαρία Αποστολοπούλου, Μαρία Δουκάκη, Μαρίλη Ζαρκάδα, Νίκος Πρέσσας, Στέλλα Παπαθανασίου, Τάσος Μπαμπάσης, Τριαντάφυλλος Ελευθερίου. 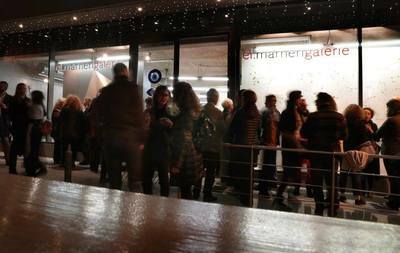 Μετά την επιτυχημένη αρχή της 1ης Εαρινής Σύναξης 2013, η Σχολή Αργυροχρυσοχοΐας Στεμνίτσας και η Στέγη Αργυροχρυσοχοΐας Στεμνίτσας, υπό την αιγίδα του Δήμου Γορτυνίας, διοργανώνουν τη 2η Εαρινή Σύναξη Αργυροχρυσοχόων, από τις 2 έως τις 11 Μαΐου 2014, στη Στεμνίτσα Αρκαδίας. 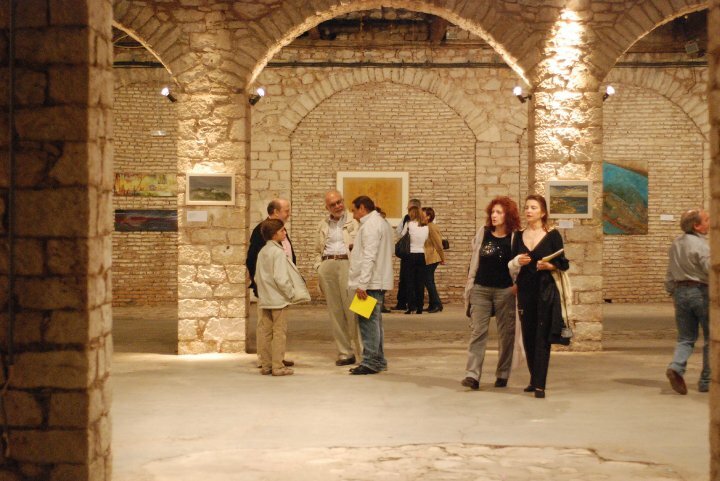 Περιλαμβάνει εξειδικευμένα σεμινάρια από επαγγελματίες του χώρου προς μαθητές, αποφοίτους και εκπαιδευτικούς Σχολών Αργυροχρυσοχοΐας. Σε μια εποχή που η μαθητεία –μέσω της αγοράς εργασίας- δίπλα σε παλιούς αριστοτέχνες μαστόρους, αλλά και σε νέους εξειδικευμένους αργυροχρυσοχόους γίνεται όλο και πιο δύσκολη, η Εαρινή Σύναξη Αργυροχρυσοχόων επιχειρεί να μεταδώσει τη γνώση χωρίς «κρυφά» σημεία, να φέρει σε επαφή τη νέα γενιά αργυροχρυσοχόων με την παλαιότερη και, εν τέλει, να δημιουργήσει τις κατάλληλες συνθήκες για μια νέα ελληνική αργυροχρυσοχοΐα, όπου η σύγχρονη αντίληψη του design θα συνδυάζεται με την αρτιότητα παλαιών τεχνικών. 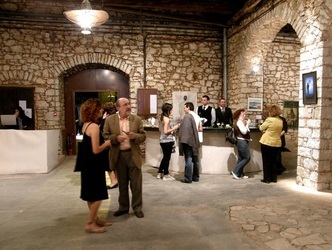 Η διοργάνωση εκφράζει, με την ευκαιρία αυτή, θερμές ευχαριστίες προς όλους τους συμμετέχοντες δασκάλους που με την αφιλοκερδή τους συμμετοχή στηρίζουν το παραπάνω όραμα. 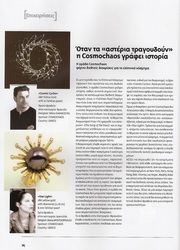 Glyptography jewellery by the prominent Greek designers of Cosmochaos studio, are now being presented at the British Museum shop. The British Museum through its shop promotes to the international public works by contemporary artists inspired by the history and art of ancient civilizations. 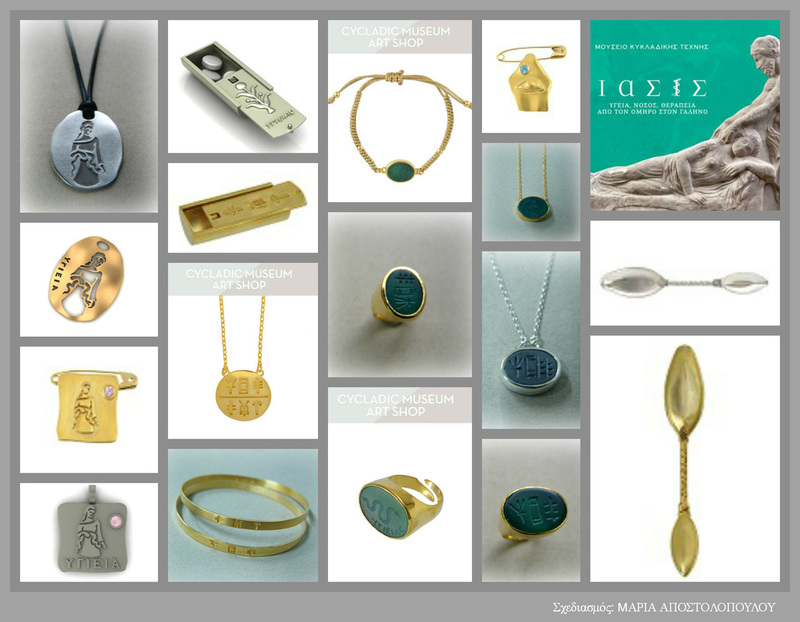 Amongst them as of May 2013 Greek jewelry by COSMOCHAOS design studio. 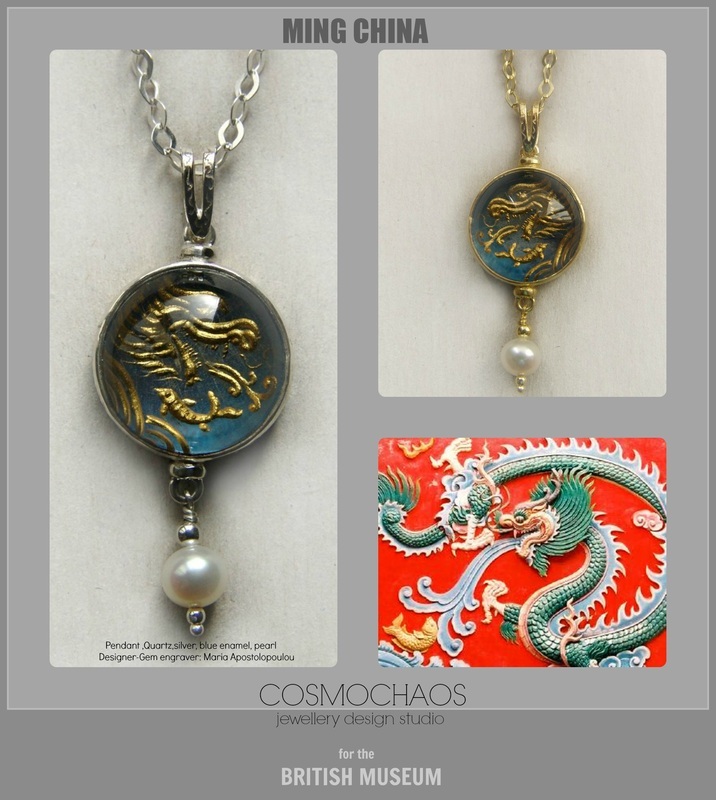 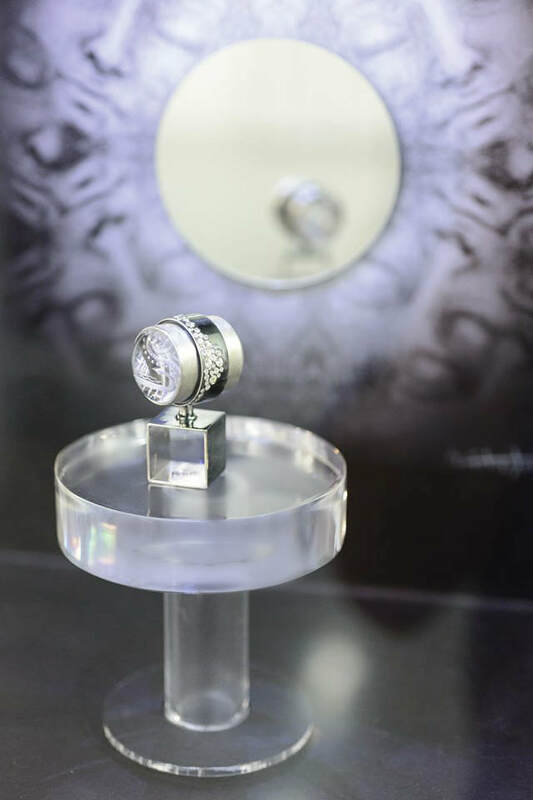 Cosmochaos designs and creates jewelry since 1994, focusing on the revival of the ancient art of Glyptography, the art of carving and engraving of precious stones which flourished in prehistoric and classical Greece. 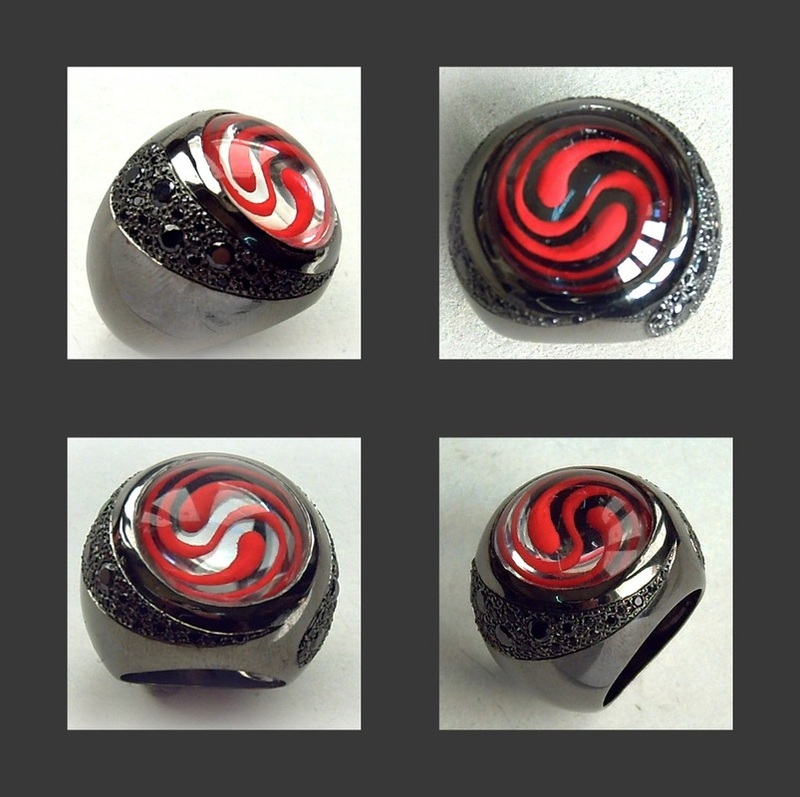 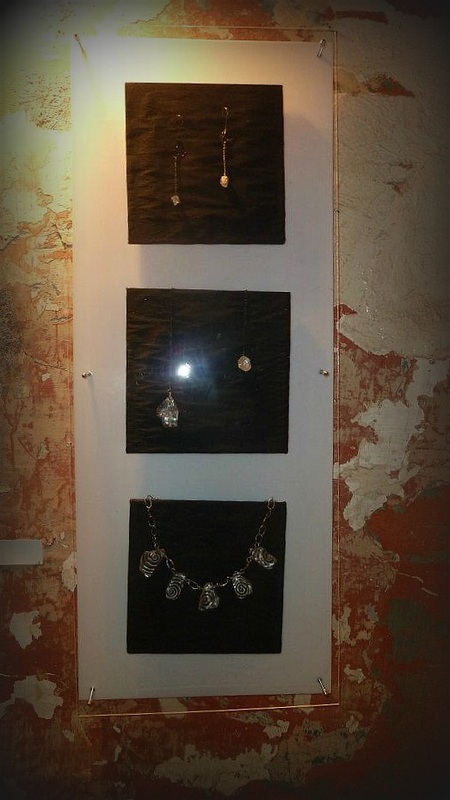 Through "The Glyptic collection", it contributes to help maintain and evolve this fine art which is disappearing. 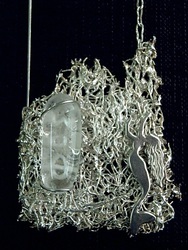 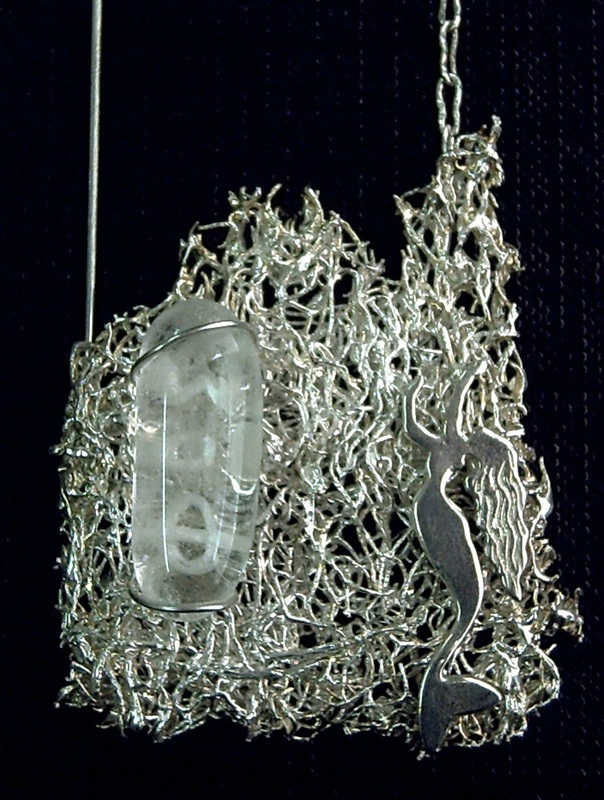 With raw material such as silver and rock crystal, the clear and colorless variety of the mineral quartz (Quartz), the eminent designers of Cosmochaos studio, Maria Apostolopoulou and Nikos Karakostas, develop specific, multilevel techniques interweaving ancient Glyptography with contemporary design. 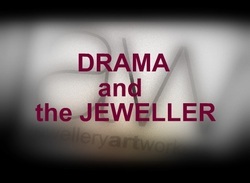 Archetypal symbols, images inspired by the universe, nature, the laws of harmony and randomness of chaos, hand carved on gemstones by diamond. 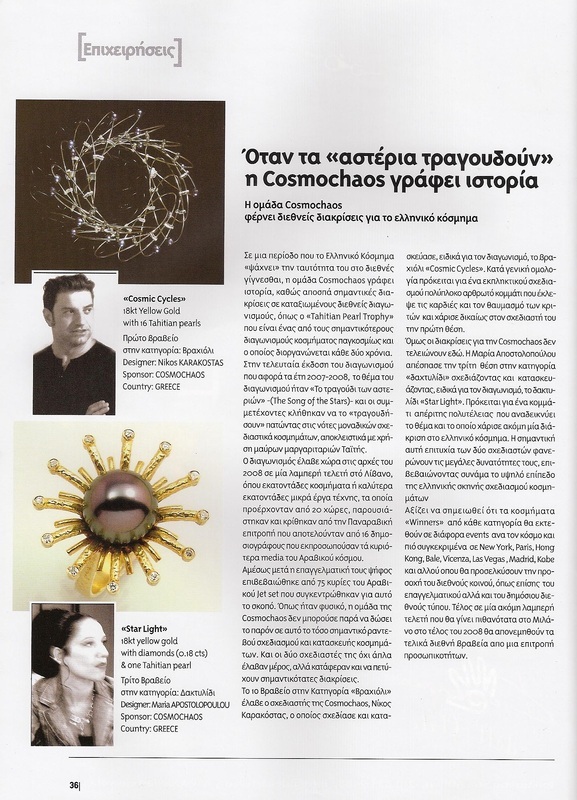 Jewelry reinvents its primal symbolist dimension and Modern Greek jewelry acquires the position it deserves in the international scene. 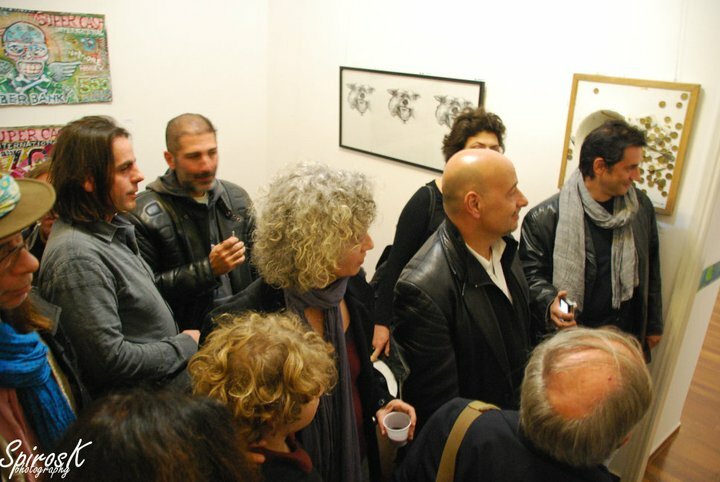 Tα γλυπτικά κοσμήματα των διακεκριμένων Ελλήνων σχεδιαστών κοσμημάτων του Cosmochaos studio, στο πωλητήριο του Βρετανικού μουσείου. 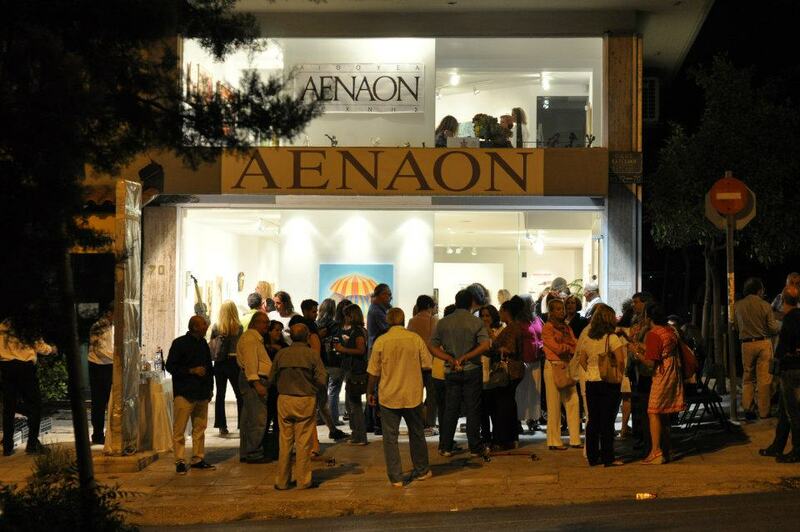 Το Βρετανικό μουσείο μέσα από το πωλητήριο του προωθεί στο διεθνές κοινό δουλειές σύγχρονων καλλιτεχνών με σημαντικό έργο εμπνευσμένο από την ιστορία και την τέχνη των αρχαίων πολιτισμών. 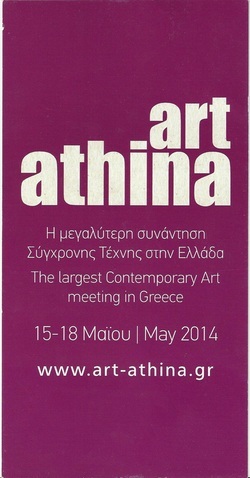 Ανάμεσα τους από Μάιο του 2013 βρίσκονται και τα κοσμήματα των Ελλήνων σχεδιαστών του COSMOCHAOS jewellery design studio. 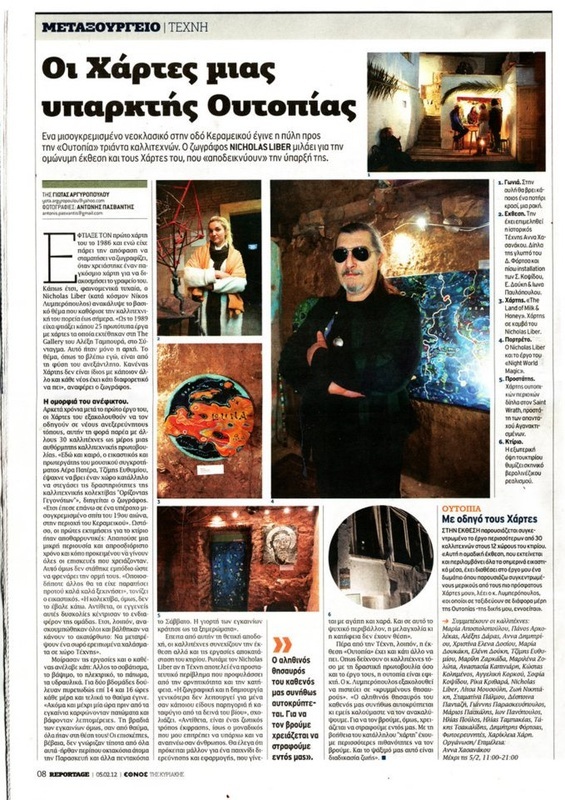 Το Cosmochaos σχεδιάζει και δημιουργεί κοσμήματα από το 1994, εστιάζοντας στην αναβίωση της αρχαίας τέχνης της γλυπτογραφίας ή σφραγιδογλυφίας, δηλαδή την τέχνη της γλυπτικής και χάραξης των πολύτιμων λίθων που άνθισε στην προιστορική και κλασσική Ελλάδα. 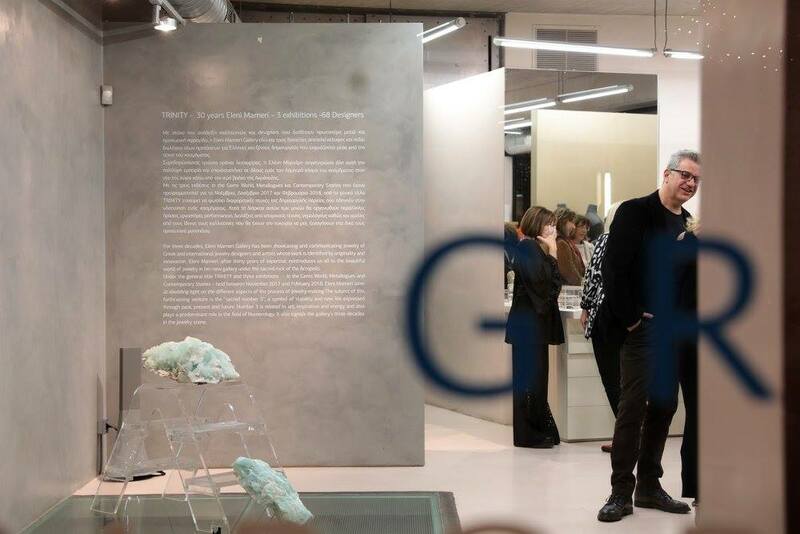 Μέσα από τη συλλογή του "Τhe Glyptic collection" , συμβάλλει στη διάσωση και σύγχρονη εξέλιξη της υψηλής αυτής τέχνης που τείνει να εξαφανιστεί. Με πρώτες ύλες το ασήμι και την Ορεία Κρύσταλλο, δηλαδή τη διάφανη και άχρωμη ποικιλία του ορυκτού χαλαζία (Quartz ), οι διακεκριμένοι σχεδιαστές του Cosmochaos studio, Μαρία Αποστολοπούλου και Νίκος Καρακώστας, μέσα από τη γλυπτογραφική τους συλλογή αναπτύσσουν ιδιαίτερες, πολυεπίπεδες τεχνικές συνυφαίνοντας την αρχαία γλυπτογραφία με το σύγχρονο design. Αρχετυπικές εσώγλυφες παραστάσεις- σύμβολα , εικόνες εμπνευσμένες από το σύμπαν, τη φύση, τους νόμους της αρμονίας και την τυχαιότητα του χάους, χαράσσονται με το χέρι πάνω σε πολύτιμους λίθους, με μοναδικό εργαλείο το σκληρότερο υλικό της φύσης , το διαμάντι. Το κόσμημα επανεφευρίσκει την συμβολιστική του διάσταση και η σύγχρονη Ελληνική κοσμηματοποιΐα τοποθετείται στη θέση που της αξίζει μέσα στην διεθνή σκηνή. 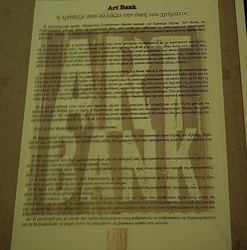 Η Τράπεζα Τέχνης (Art Bank) πρόκειται να διεξάγει στην AGORA δημοπρασία καλλιτεχνικών νομισμάτων (art cash) κατά την διάρκεια της παρουσίασης της δράσης της, που έχει σκοπό την κυκλοφορία καλλιτεχνικού χρήματος. 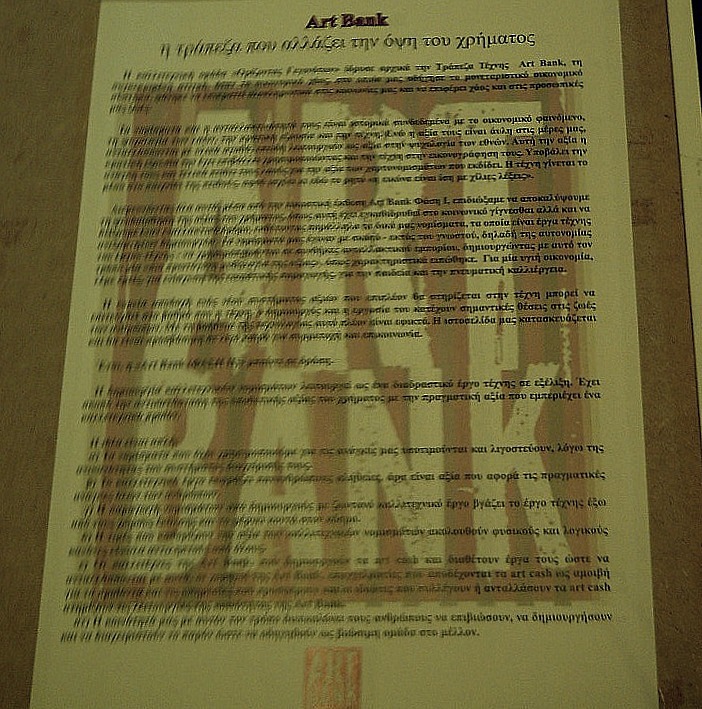 Οι δημιουργίες των εικαστικών της Art Bank είναι έργα τέχνης σε μορφή νομισμάτων. 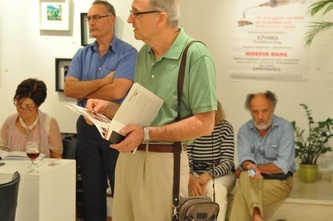 Κατά την διάρκεια της δημοπρασίας, οι καλλιτέχνες θα προσφέρουν τα έργα τους για να ανταλλαχθούν με προϊόντα και υπηρεσίες, όπως βιολογικά τρόφιμα μακράς διαρκείας, οινοπνευματώδη, ψάρια, γατοτροφές, πετρέλαιο κίνησης, διανυκτερεύσεις σε ξενοδοχείο στο Λουτράκι, φωτογραφικό υλικό, ιδιαίτερα μαθήματα, εργασίες ανακαίνισης και συντήρησης σε πρόσοψη και κλιμακοστάσιο κτηρίου, διακοσμητικά φυτά, προτομή (κυκλαδίτικο κεφάλι κατά προτίμηση), και άλλα. 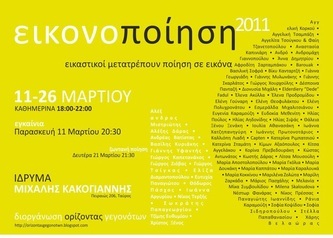 Η δημοπρασία θα αρχίσει στις 18.00. 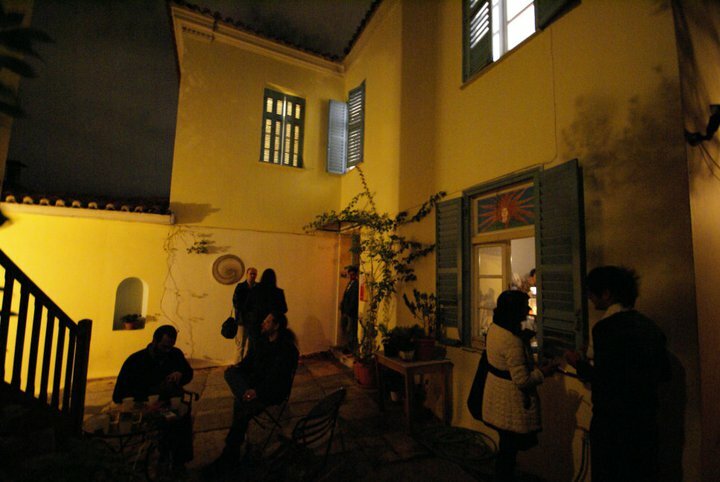 Όσοι ενδιαφέρονται να συμμετέχουν για να ανταλλάξουν προϊόντα και υπηρεσίες παρακαλούνται να προσέλθουν στον χώρο μισή ώρα πριν την έναρξη για να ενημερωθούν. 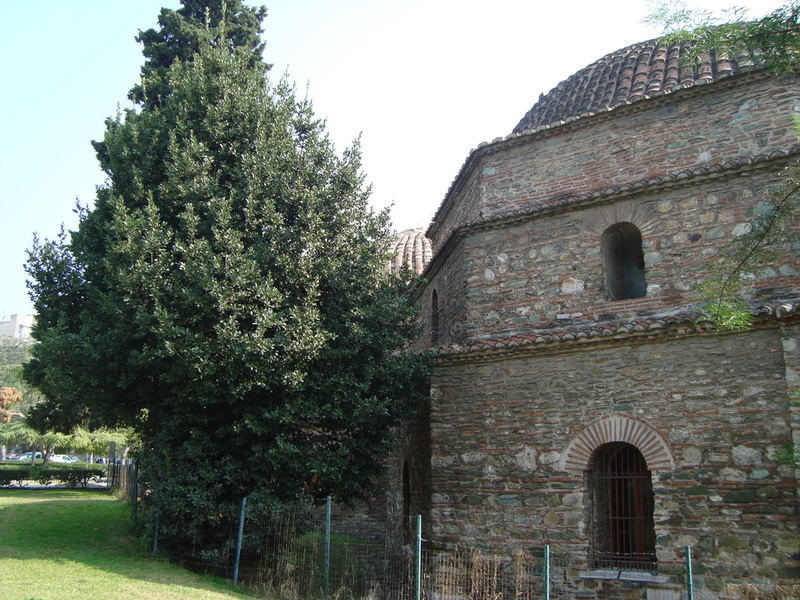 Αλίρα Καλογερά, Αναστασία Καπινιάρη, Αφροδίτη Γούλα, Γιάννης Αντωνόπουλος, Δέσποινα Πανταζή, Διαμαντής Σταγγίδης, Ελένη Πολυχρονάτου, Έλλη Χούσου, Θεοφάνης Κωνσταντίνου, Ισμήνη Μπονάτσου, Κίμων Αξαόπουλος, Κοσμάς Λιλικάκης, Cosmochaos, Κρίστη Πετροπούλου, Λίτσα Μουσούλη, Μαρία Αποστολοπούλου, Μαρία Δουκάκη, Μαρία Λιάκου, Μαρίλη Ζαρκάδα, Μάριος Πασχάλης, Μπάμπης Καραλής, Μπέττυ Τσιγαρίδα, Νίκος Πρέσσας, Ρένα Αβαγιαννού, Στέλιος Μακρυγιάννης, Τζίμης Ευθυμίου, Τριαντάφυλλος Ελευθερίου, Φωτεινή Αλεξοπούλου. 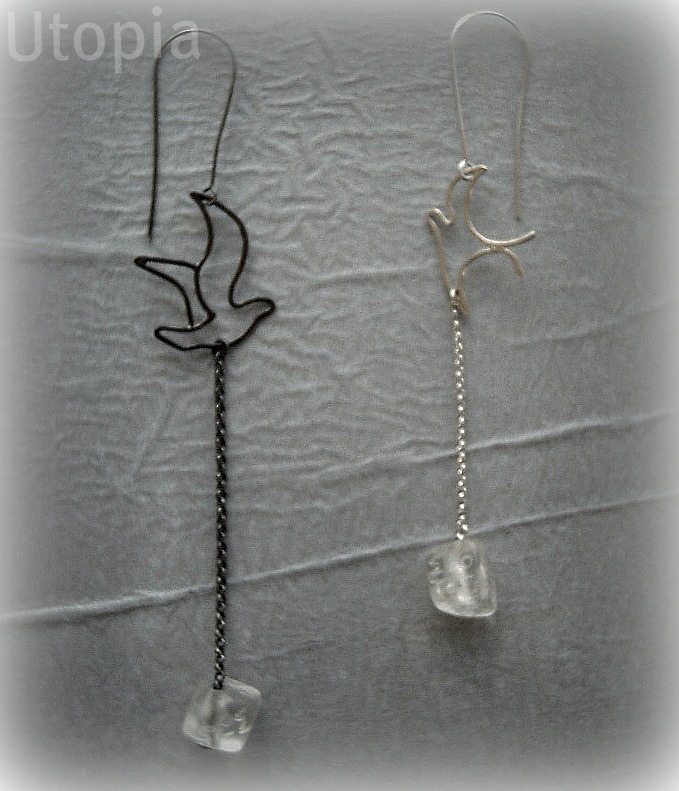 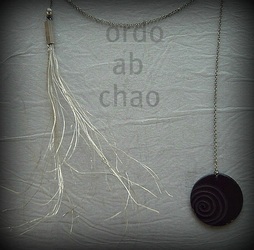 Some of my "Invocations to unknown Gods" necklaces. 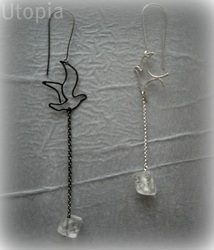 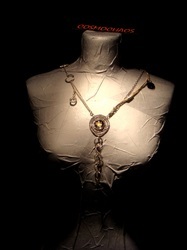 In the center "Save me" necklace made of silver,quartz and pearl. 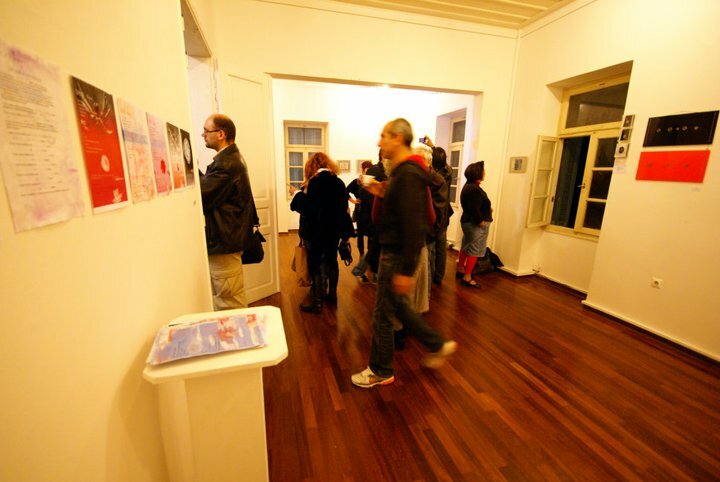 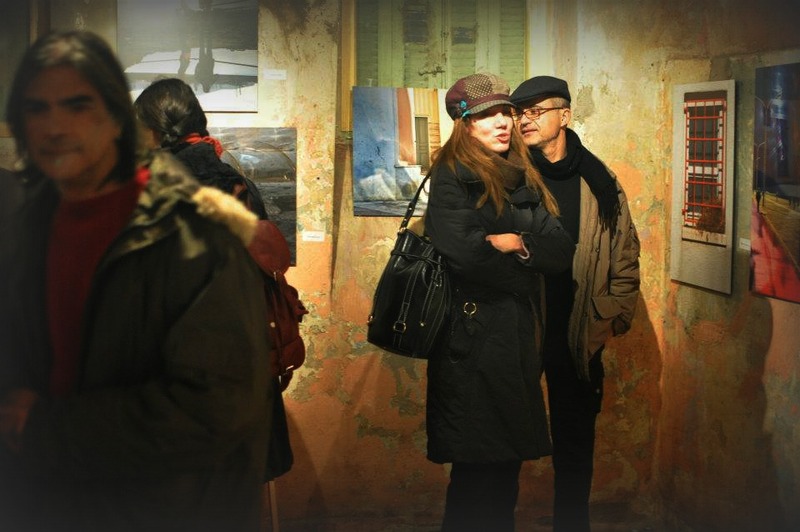 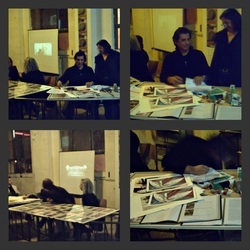 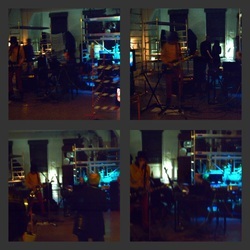 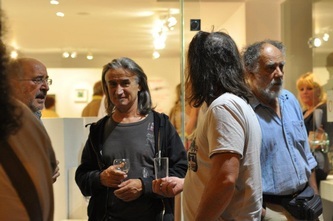 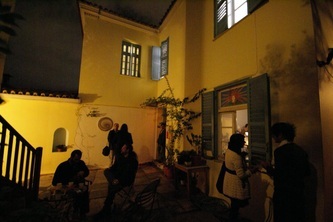 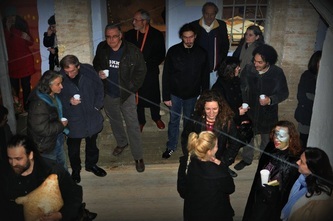 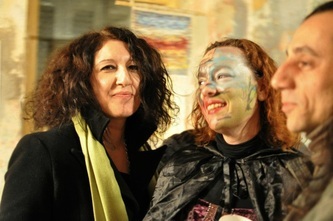 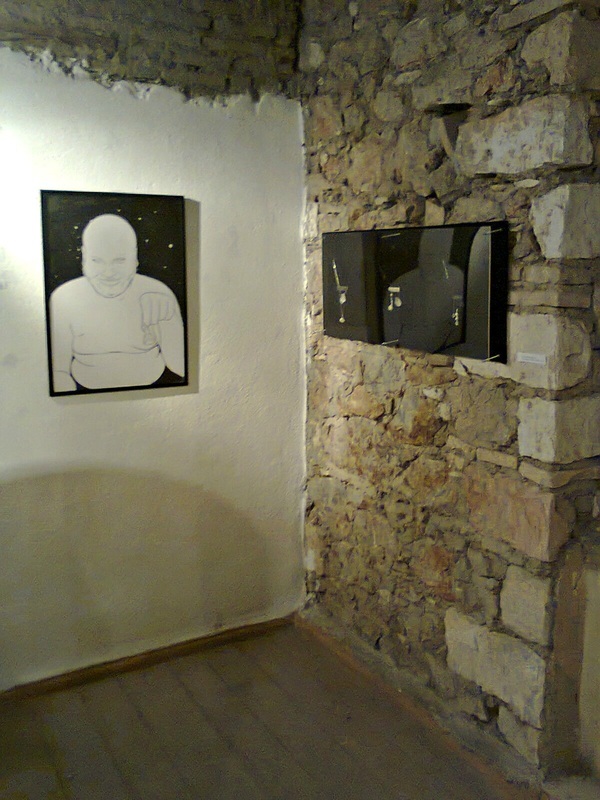 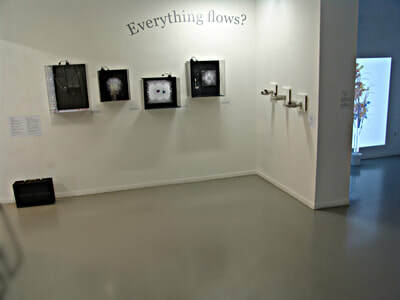 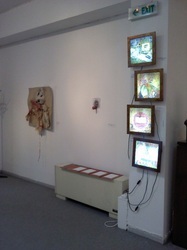 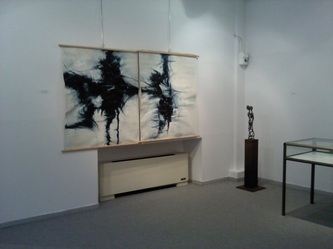 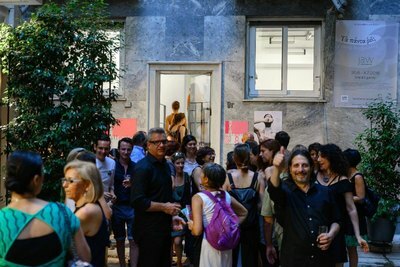 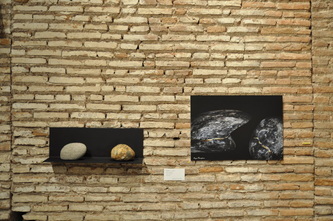 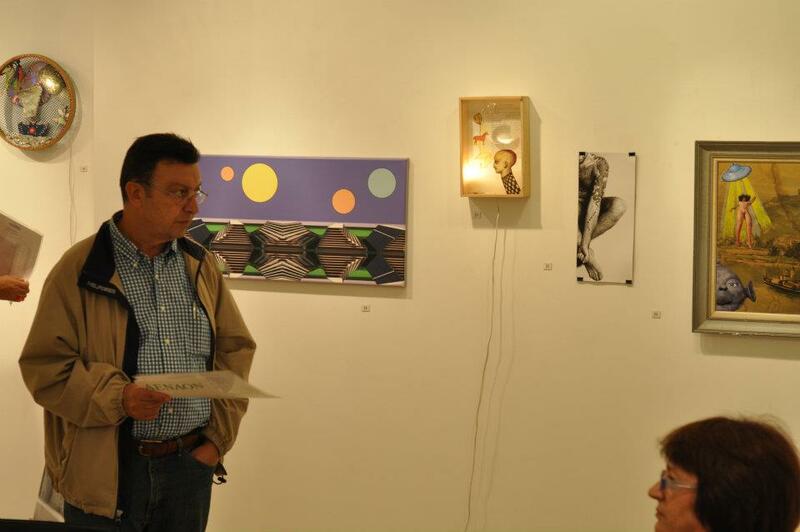 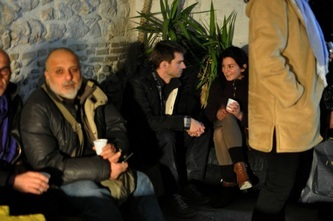 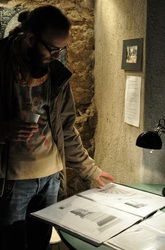 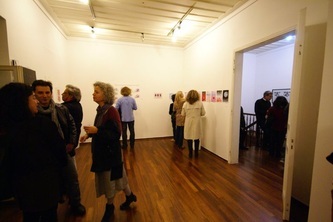 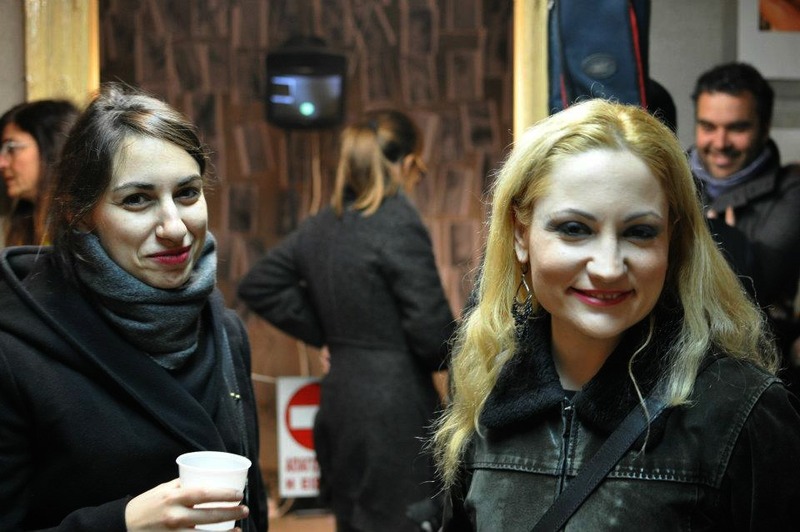 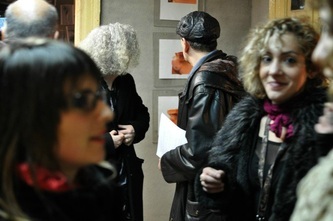 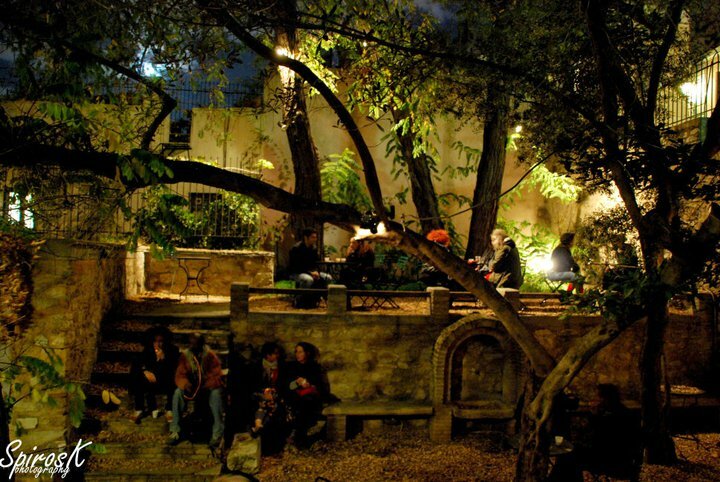 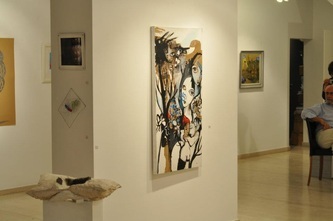 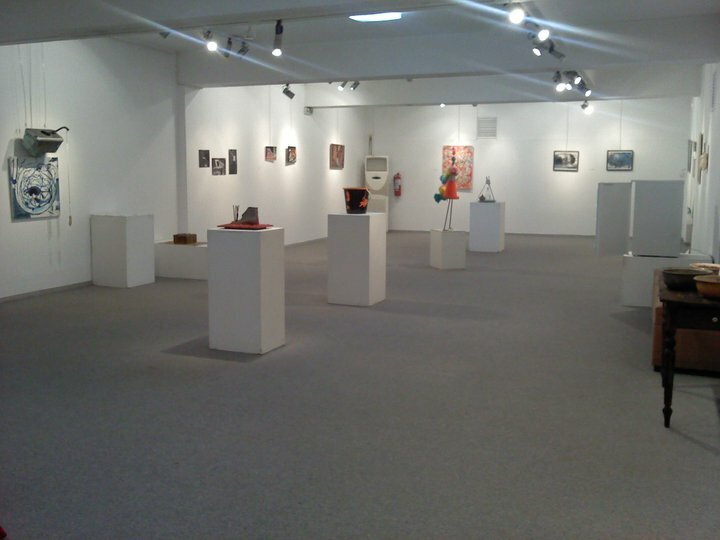 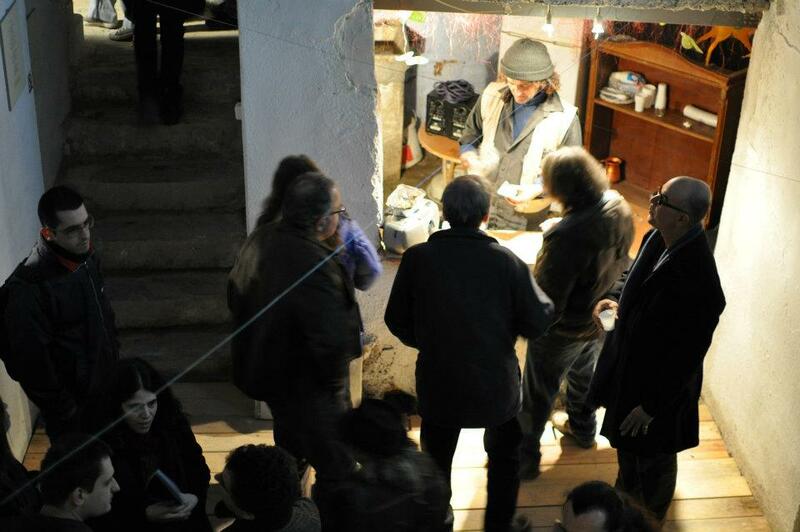 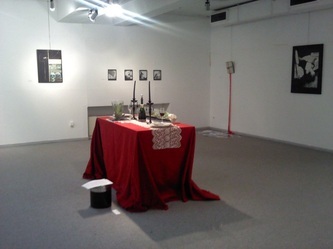 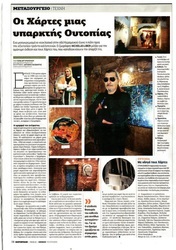 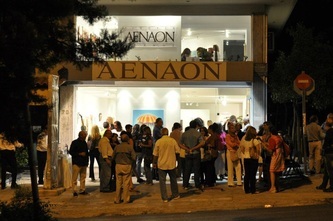 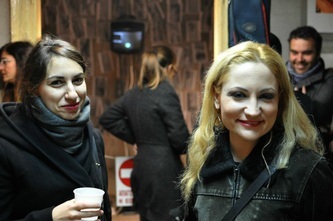 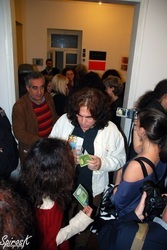 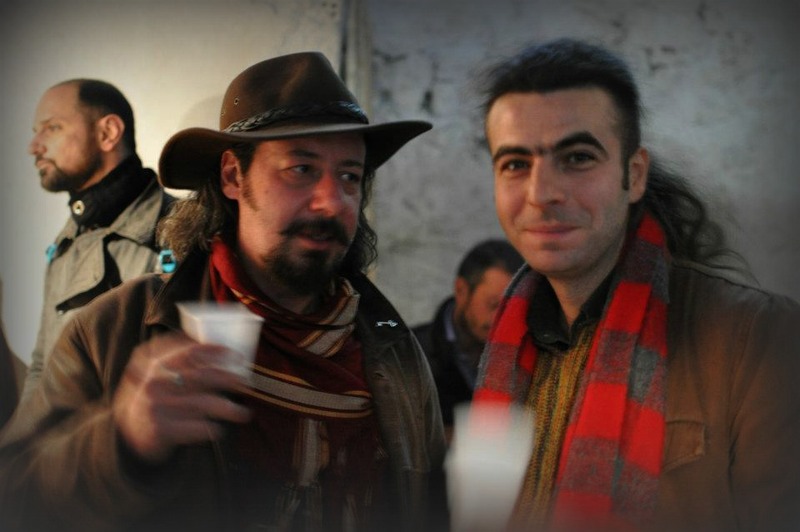 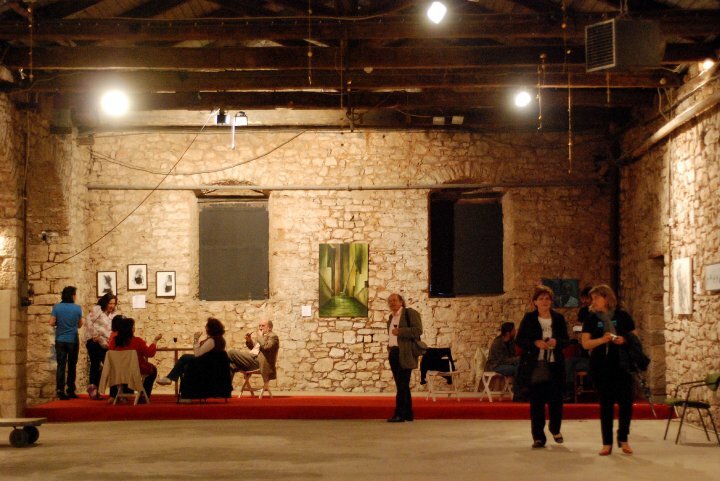 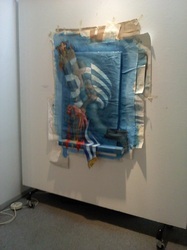 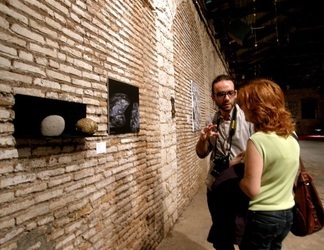 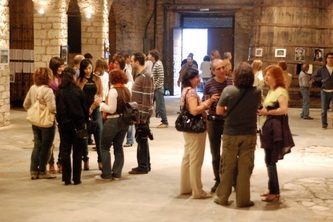 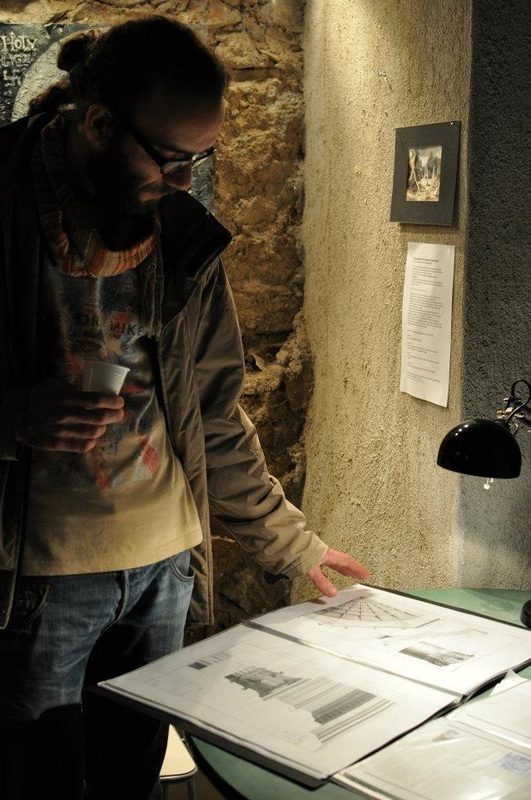 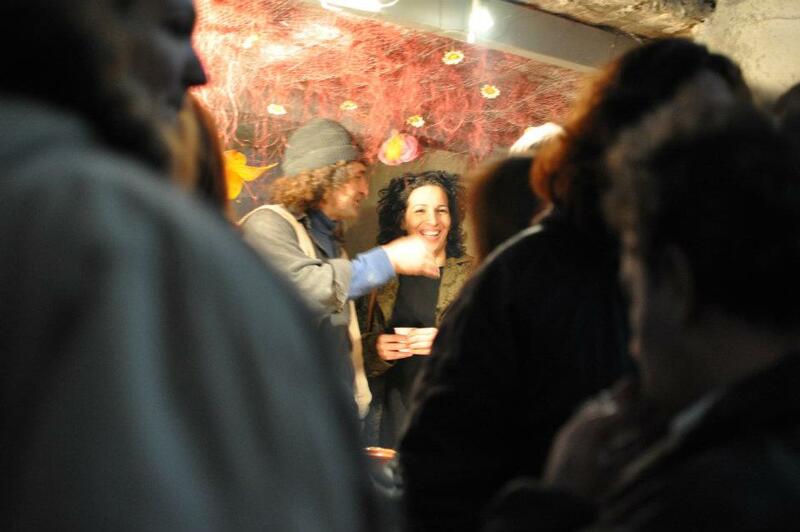 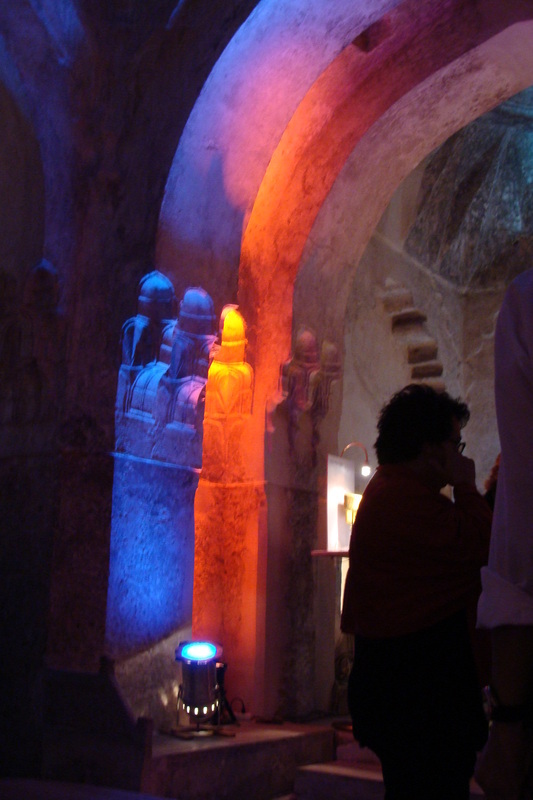 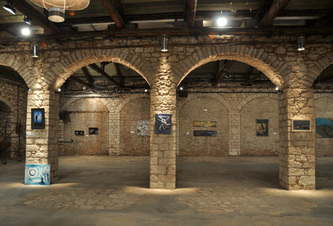 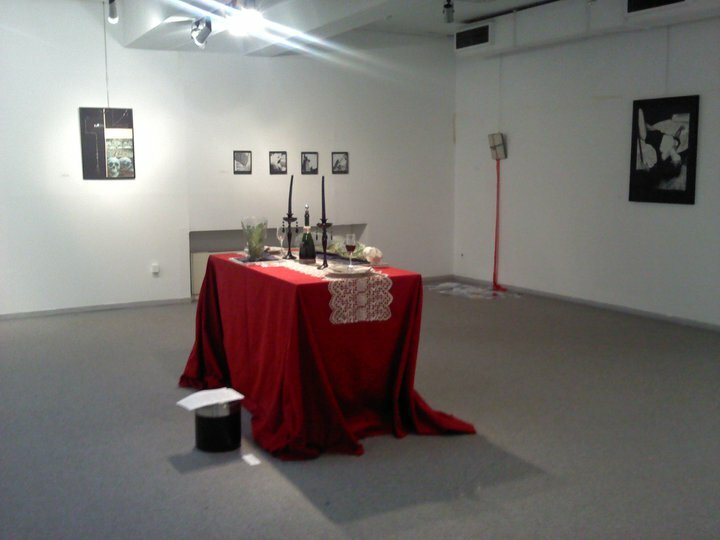 at EROTOPIA group exhibition in the Athenian Event Horizon art space, from March 16 to May 8 2012. 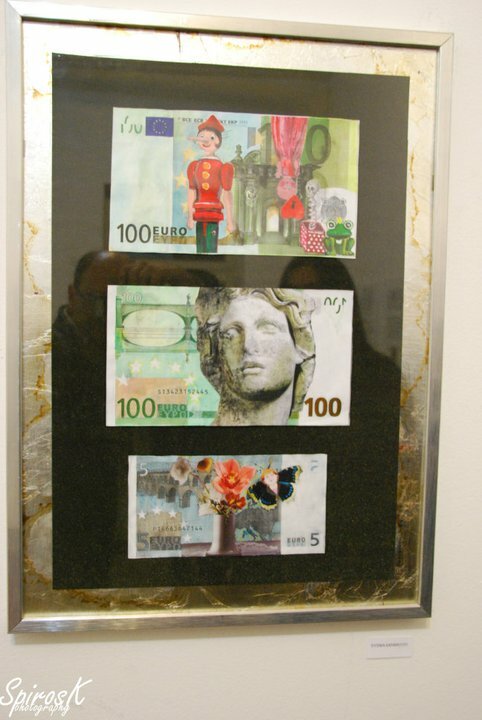 Currency and exchange value are historically linked to economic phenomena, people’s psychology, state power and art. 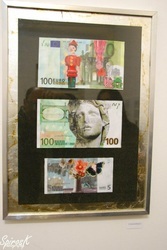 The production of currency by active artists brings the artwork closer to the public, outside of conventional exhibition spaces. 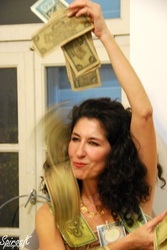 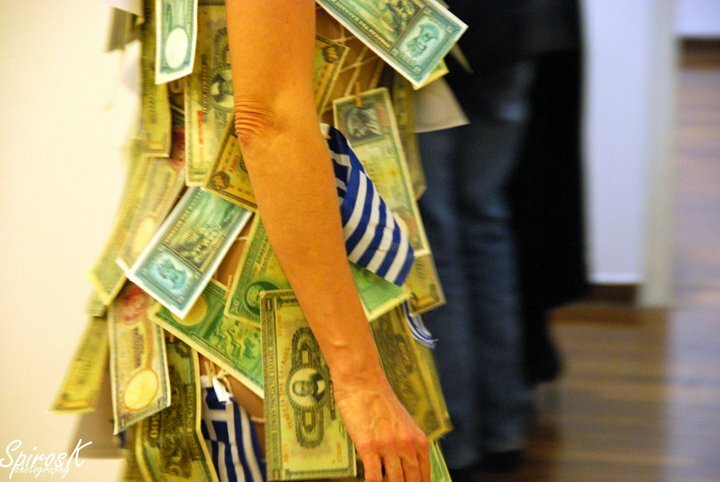 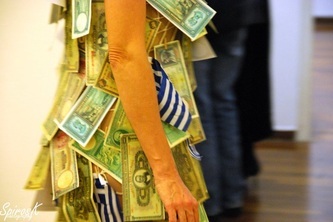 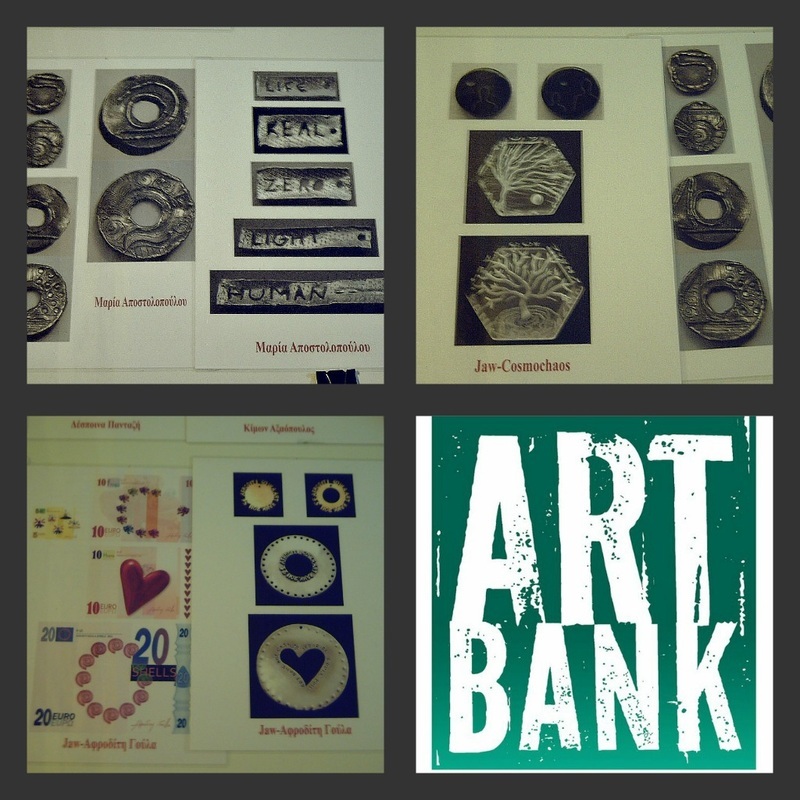 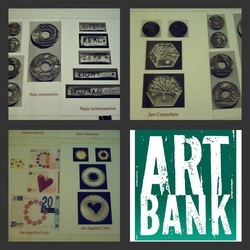 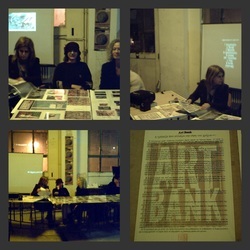 The artists of Art Bank, having worked feverishly for two years under adverse conditions (weather, financial, emotional ones and others), managed to produce currency/art works, presented and exchanged within the 3rd Athens Biennale. 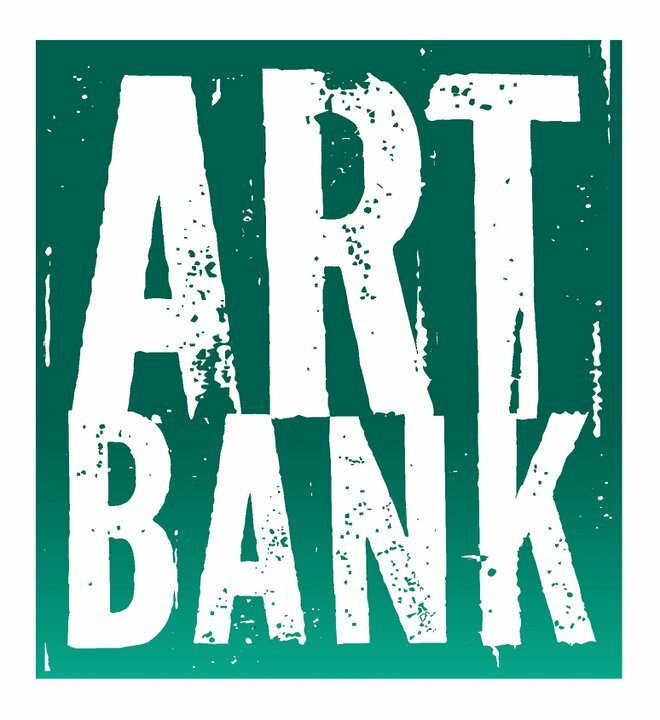 At the same time, there will be a call for artists, businesses, professionals and individuals to participate in the exchange network of Art Bank. 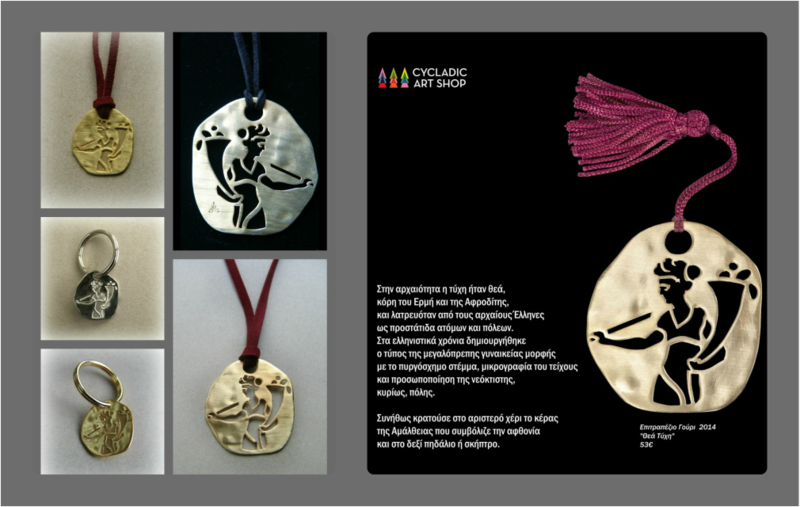 From “Electra” to “Evdokia”, from “Stella" to “Antigone”, from “Iphigenia” and the “Brides” to Marika in “Rembetiko”, these symbolic, archetypical, fatal women become muses and source of inspiration for the creator-enchanter of the earth's precious materials. 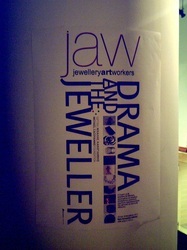 The J.A.W. (Jewellery Art Workers) group create jewels to ornament unforgettable interpretations of female characters that lit up the dark rooms. 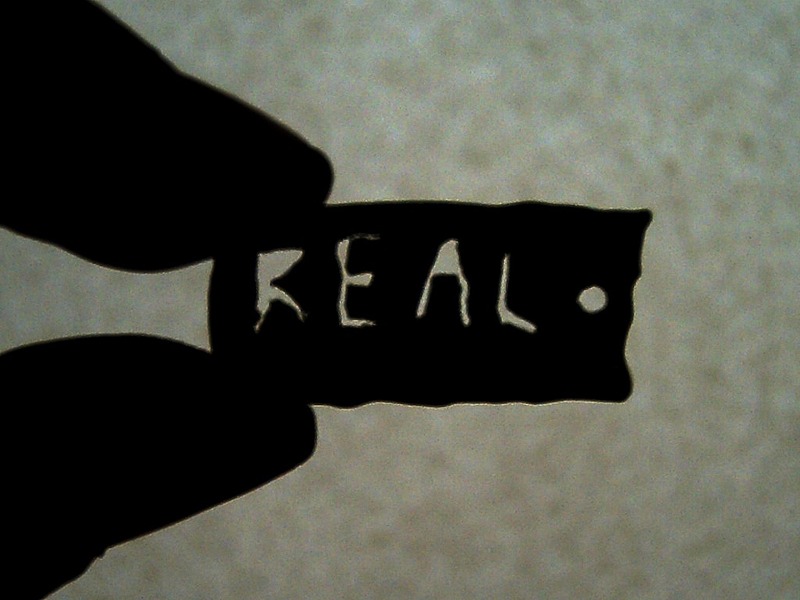 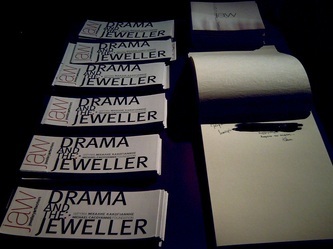 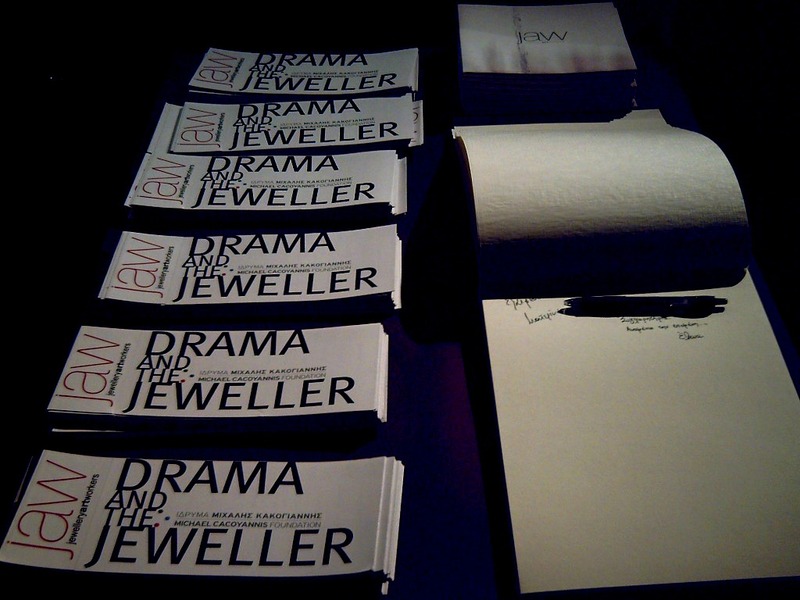 Drama and jewellery, form and performance become raw material in the hands of the 20 jewel creators of the J.A.W. 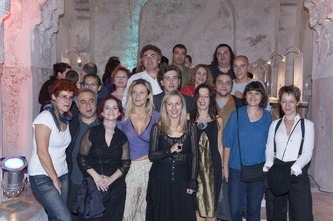 group, who trace in their unique way the history of Greek cinema. 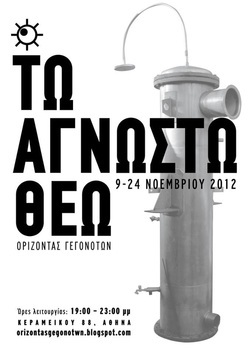 With the participation of : Achilleas Georgiadis, Afroditi Goula, Stella Deligiani, Artemis Zafrana, Thomas Thomidis, Iosif Iosifidis, Vally Kontidis, Apostolos Klitsiotis, Katerina Malami, Mary Margoni - Yiannis Mandylakis, Sarina Beza, Fotini Nikolaidou, Nikos Papadopoulos, Sofia Papalexiou, Maria Psarianou, COSMOCHAOS Maria Apostolopoulou - Nikos Karakostas , D¨OLIUM Sofia Bachlava - Vasilis Stamoulis, and the visual and video artist Theofanis Konstantinou. 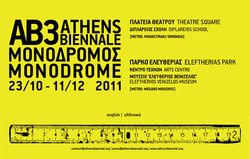 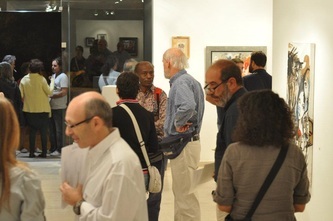 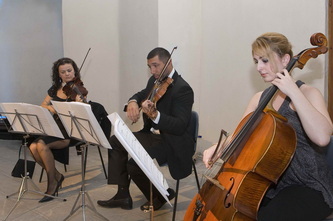 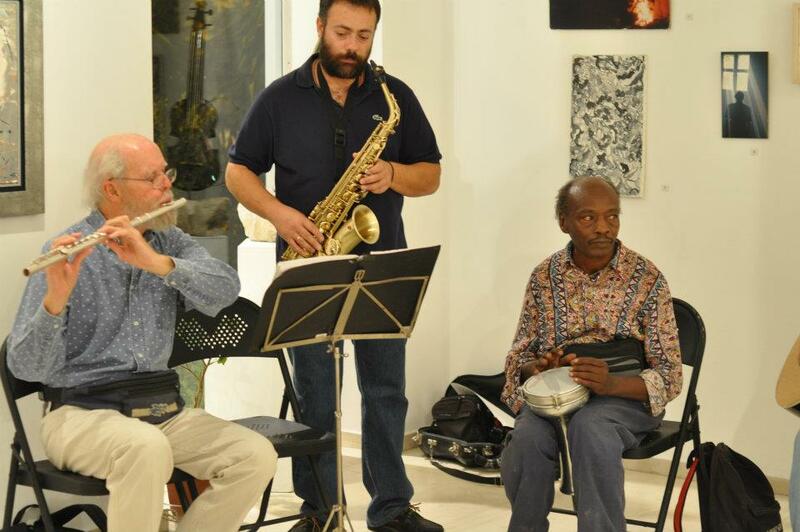 Michael Kakoyannis Foundation, November 17 to 29 November 2011. 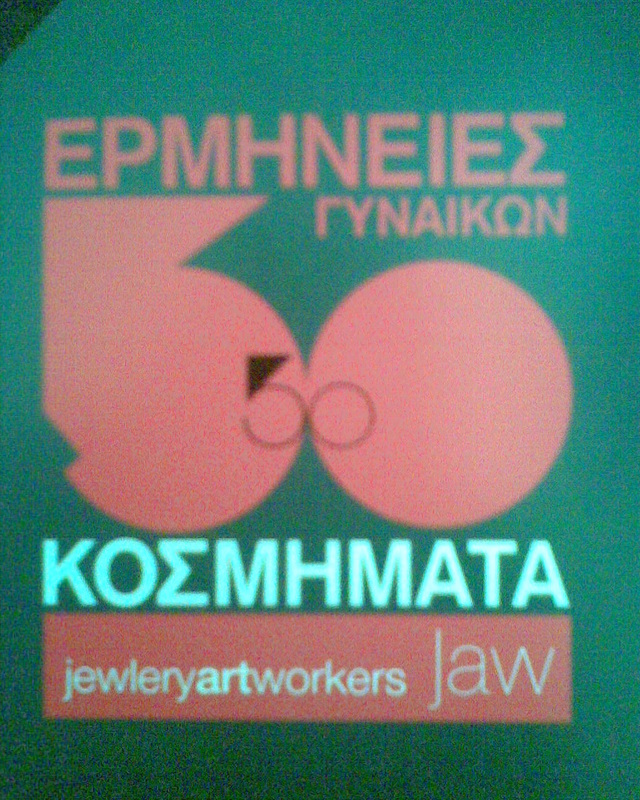 I will be there exhibiting my ephemeral jewels that will be deconstructed into their pieces and will be offered to the public during the deconstruction ceremony of all the exhibited ephemeral art works , at the last day of the exhibition. Painting,sculpture and jewels at AENAON Gallery. 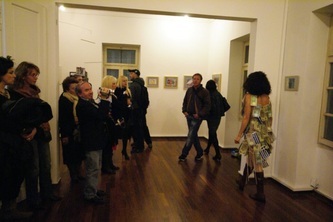 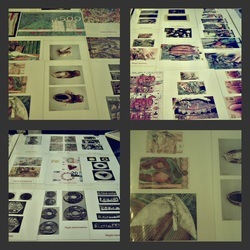 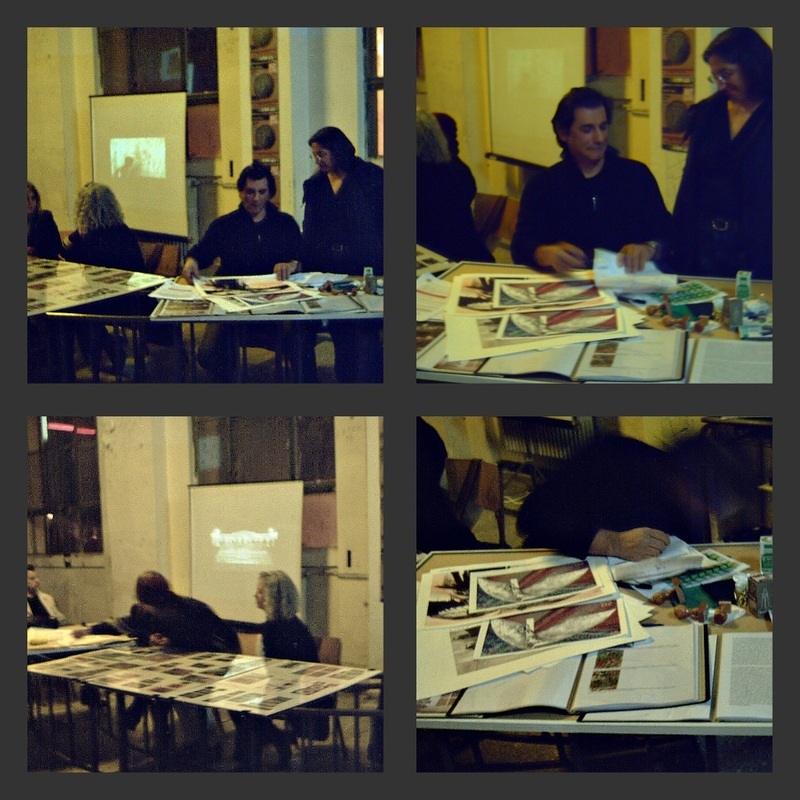 Group exhibition . 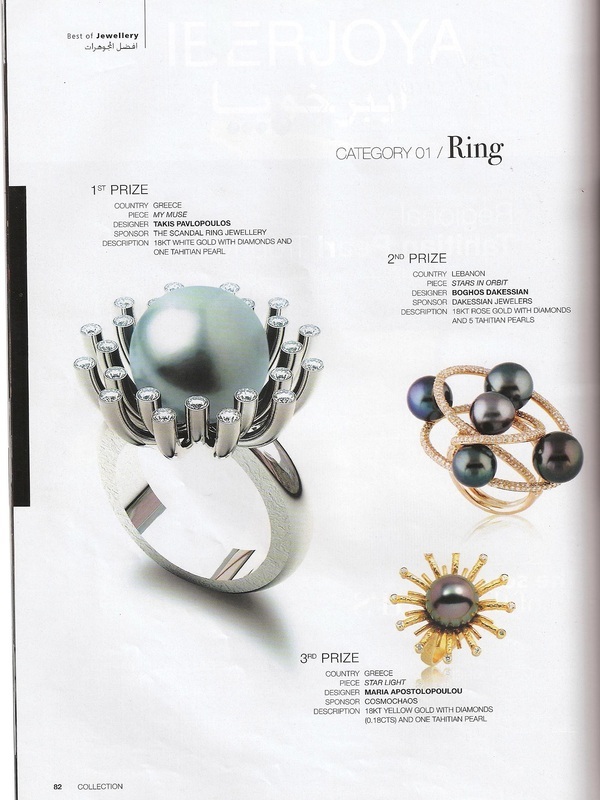 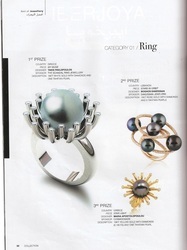 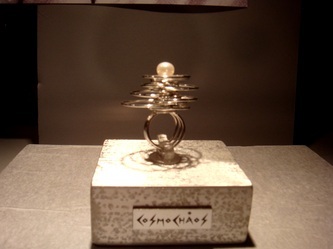 COSMOCHAOS jewellery design studio won the 1st Prize at the last Tahitian Pearl Trophy jewellery design contest for the bracelet "COSMIC CYCLES" ,designed by Nikos Karakostas. 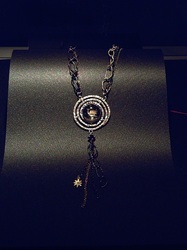 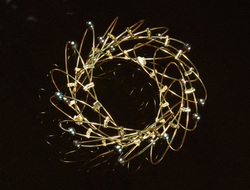 The articulated and flexible "Cosmic Cycles" bracelet is made of 18 ct yellow gold and 12mm black Tahitian Pearls.
" 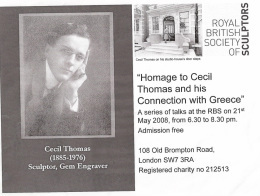 HOMAGE TO CECIL THOMAS AND HIS CONNECTION WITH GREECE"
Cecil Thomas (1885-1976) was one of England's most noted sculptors. 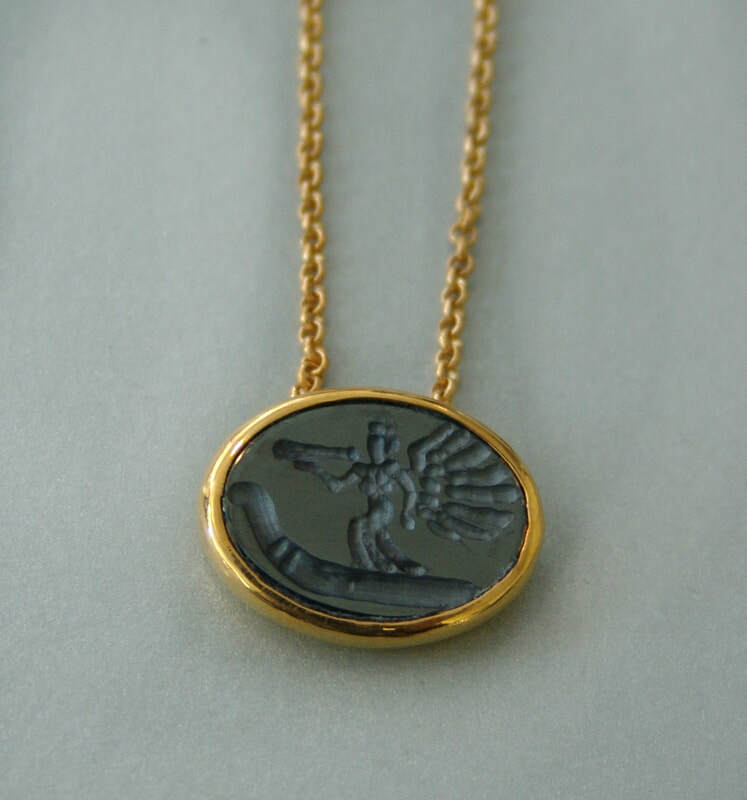 He was also a medallist, a seal and gem engraver, that carved and engraved gem materials in intaglio, cameo and miniature sculpture. 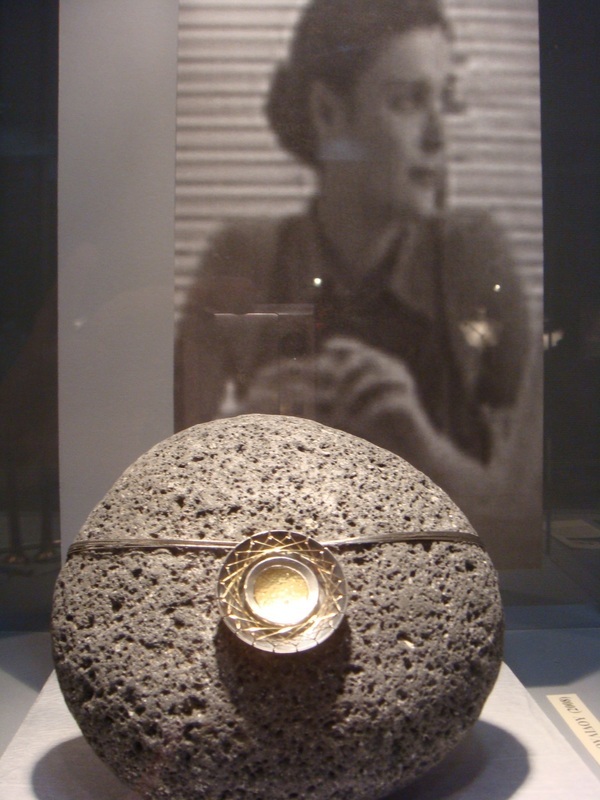 His student and heir, Nick Kielty-Lambrinides(1920-2004) was half Greek , he became a master Gem engraver in his own right and founded a School of Glyptic Arts in Athens , aiming to revive the art of Glyptography. 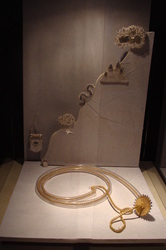 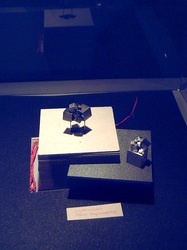 The 20th -21st century history of European Glyptography was presented at Royal Society of British Sculptors in May 2008 . 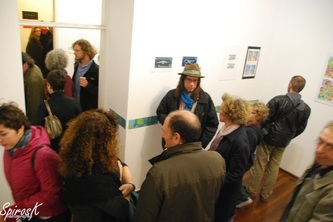 Passing from Cecil Thomas to Nick Kielty -Lambrinides , the contemporary history of glyptography is continuing and written by his own students , that had been formed into a group in 1994 called Cosmochaos ,based in Greece but exhibiting throughout Europe, carring on Thomas's and Lambrinides's tradition of excellence and inventiveness. 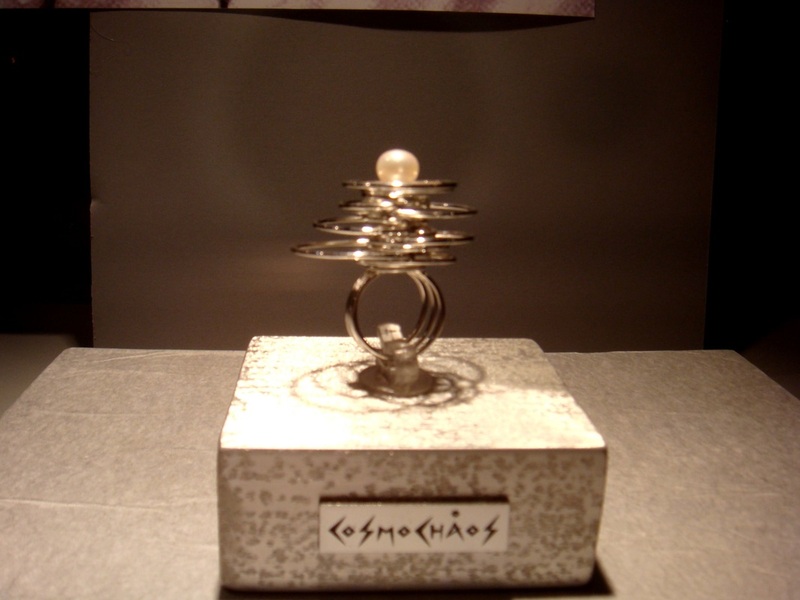 Cosmochaos (now teachers in their own right) , set the rules of Modern Glyptography. 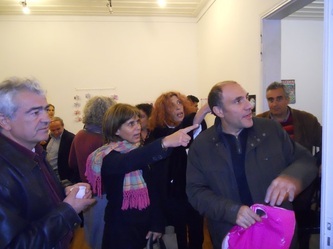 A series of lectures by Dr. Emmanuel Minne , Dr Harris Livas and Cosmochaos ,held at RBSS. 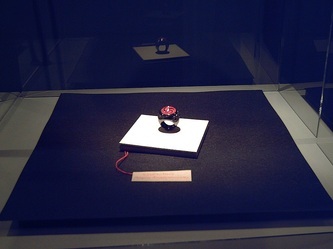 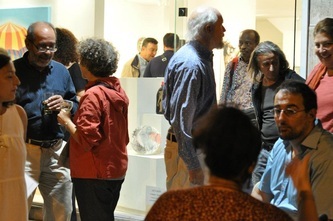 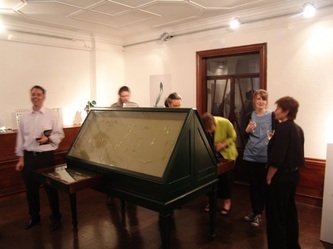 An exhibition of historic pieces made by Cecil Thomas and Nick Kielty- Lambrinides ,besides Contamporary Glyptographical pieces made by Cosmochaos studio ,gave a chance to the audience to see at close hand a number of examples of important Gem Engraving works. 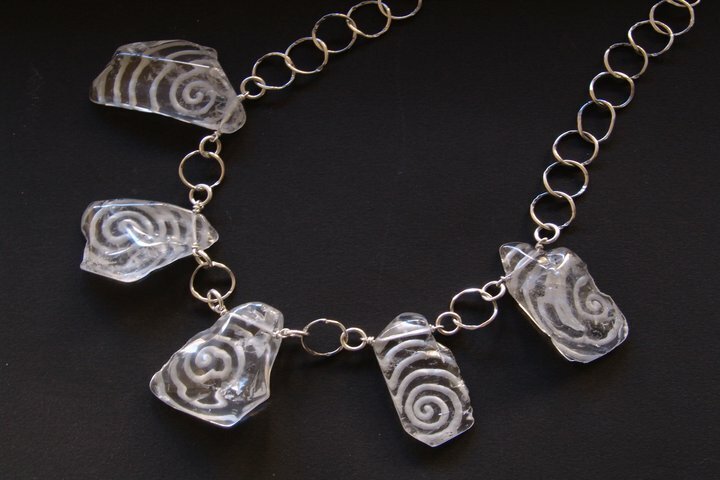 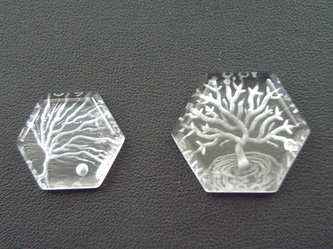 A live workshop - demonstration of Glyptography art by Cosmochaos gem artists also took place at RBSS and fascinated the audience that had the chance to watch closely a rock crystal carving by the use of diamond tools. 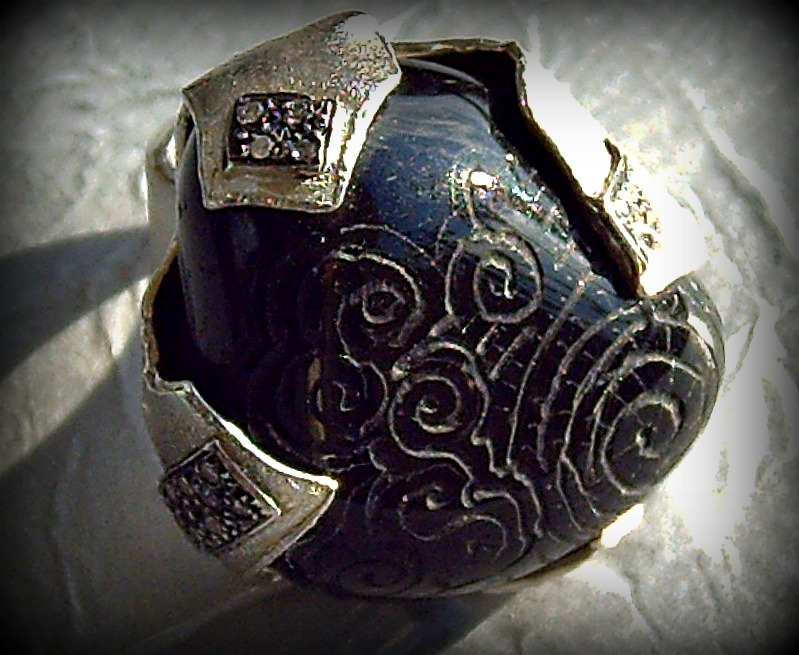 750 Yellow Gold , 14mm Black Pearl , and 12 Brilliant cut Diamonds of 0,50 cts total weight, are the noble materials used for this ring. 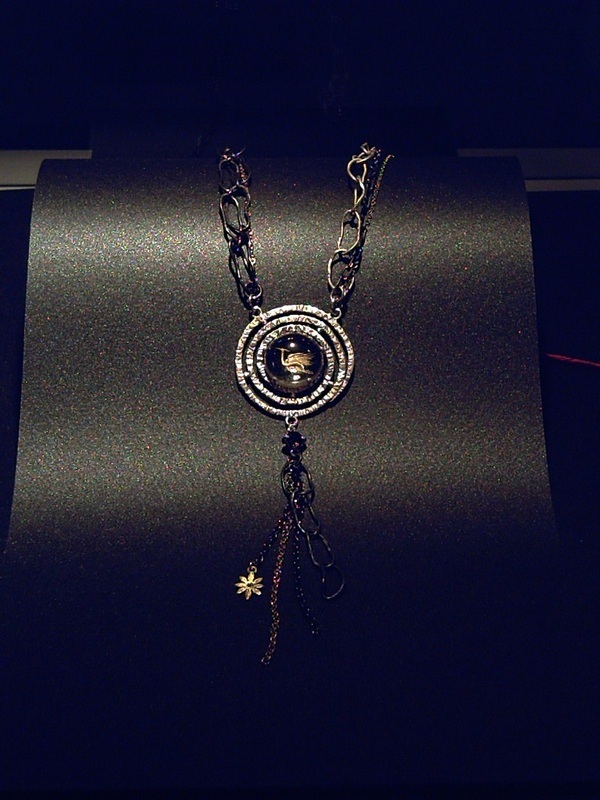 This creation is sponsored by COSMOCHAOS jewellery design studio.
" WATER " exhibition of J.A.W. 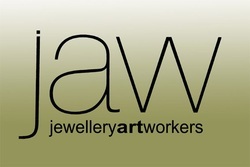 J.A.W. 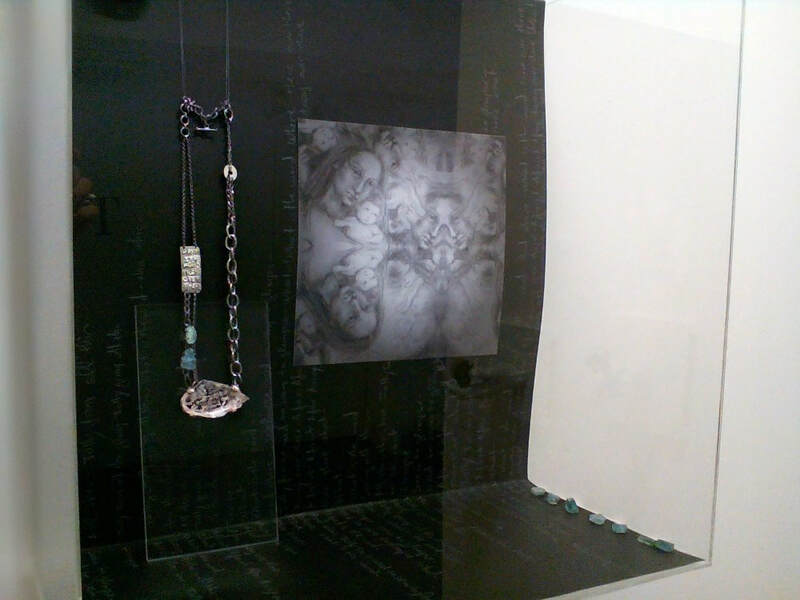 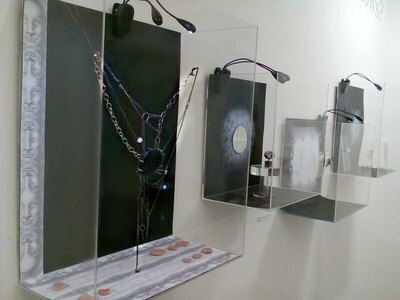 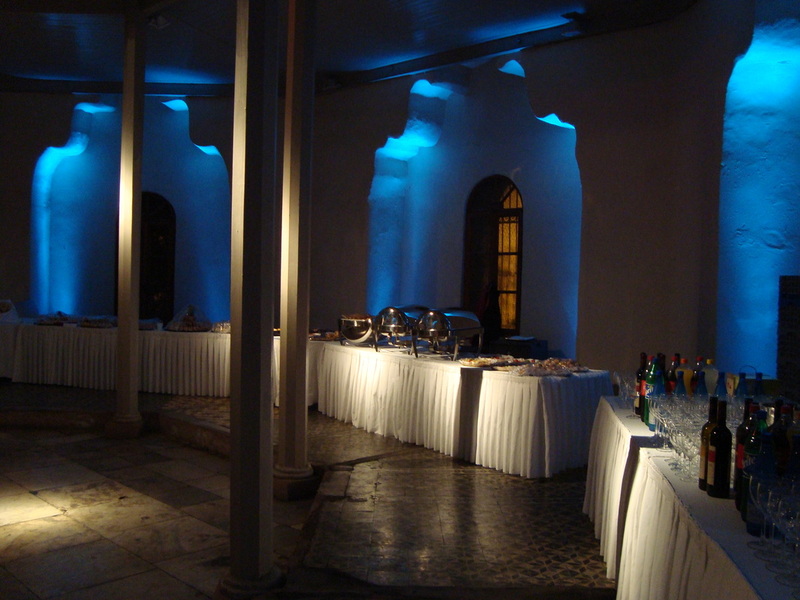 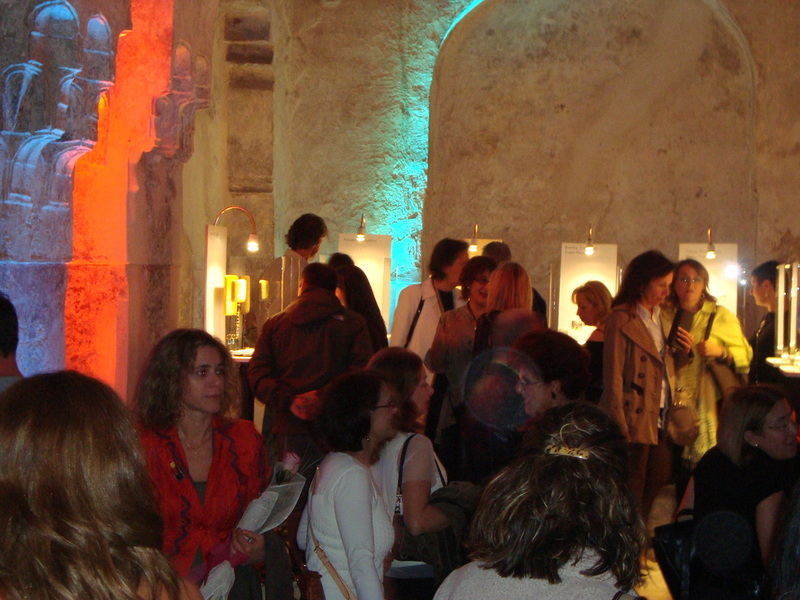 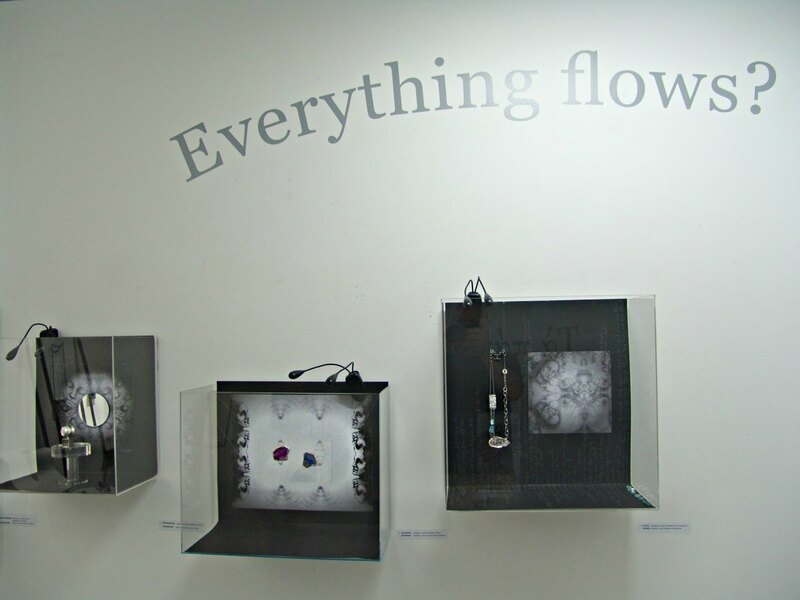 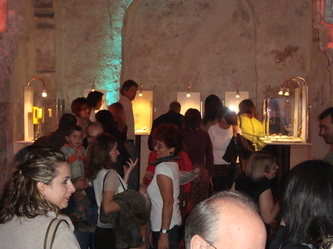 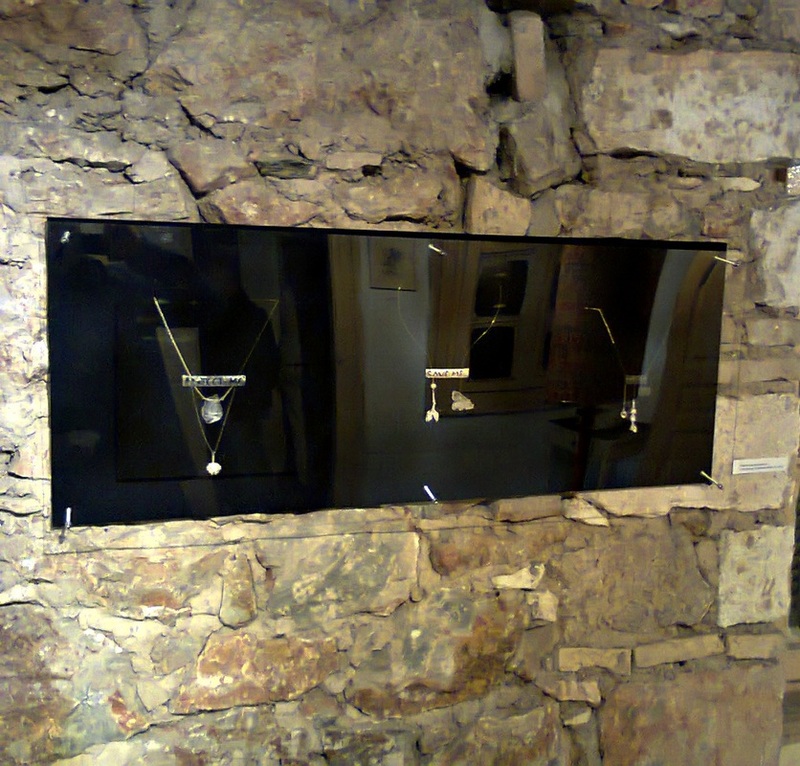 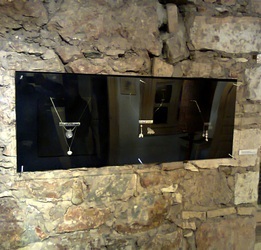 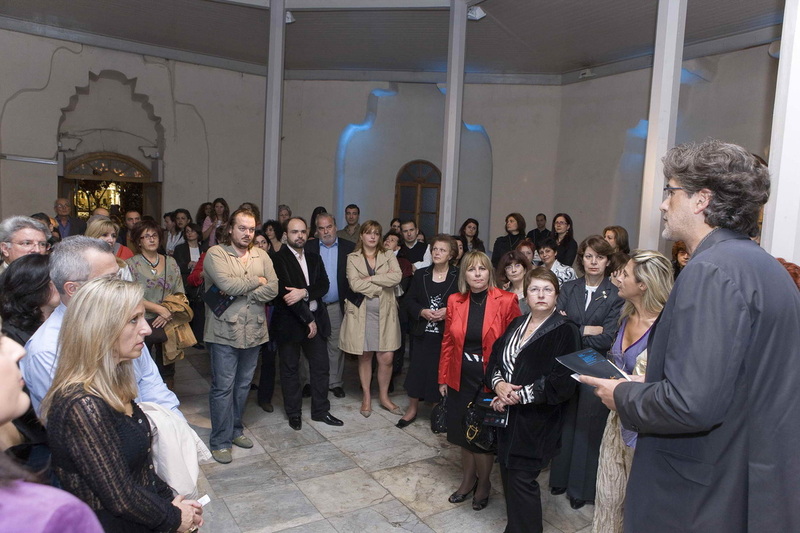 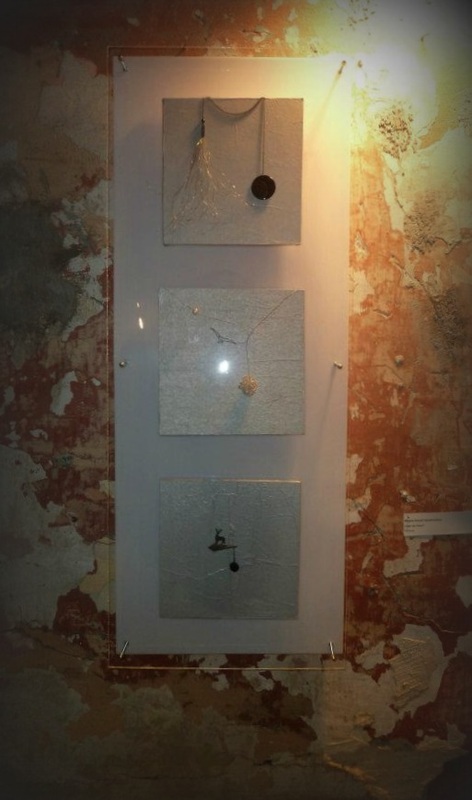 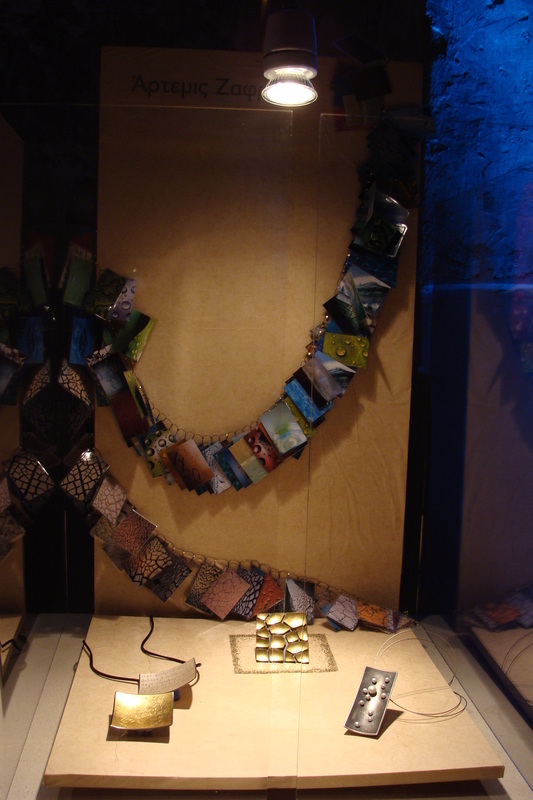 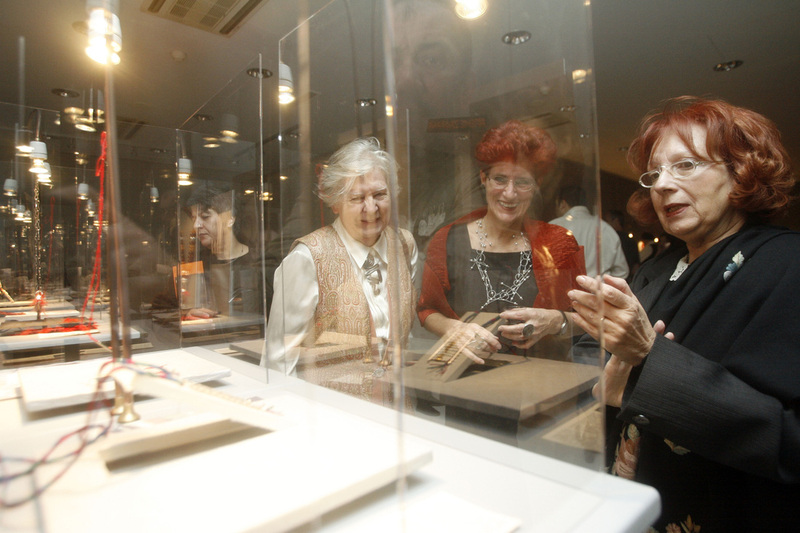 the known group of contemporary jewellery designers organized the "WATER" exhibition in the historic Bei-Hamam at Thessaloniki city. 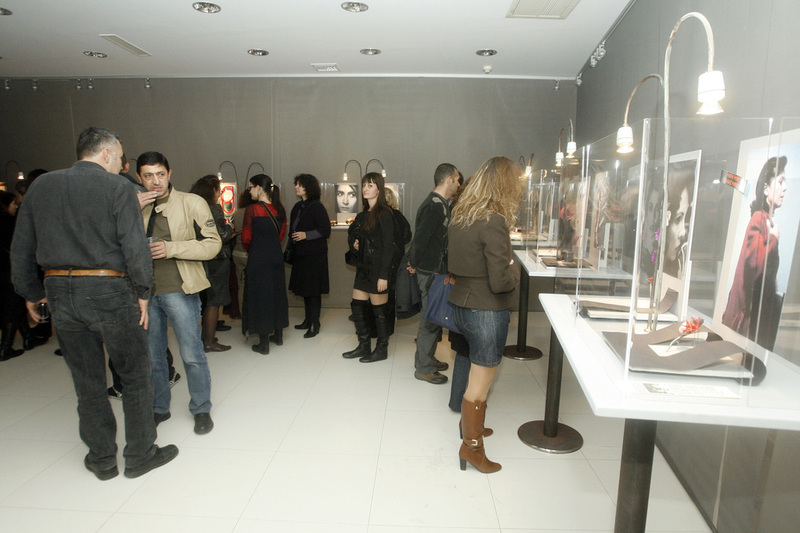 Jewelllery collections inspired of water element presented into an ambient atmosphere that attracted the interest of jewellery art lovers. 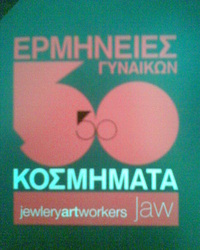 "50 jewels - 50 roles"
"50 jewels - 50 roles" was another J.A.W. 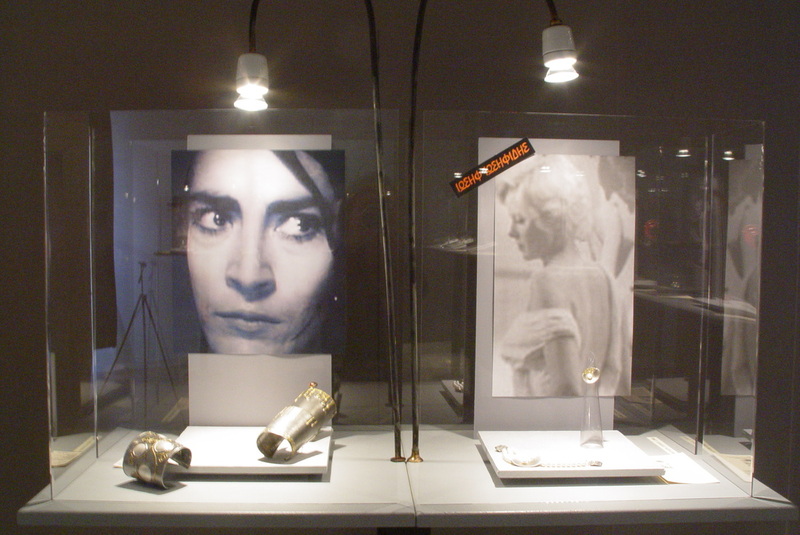 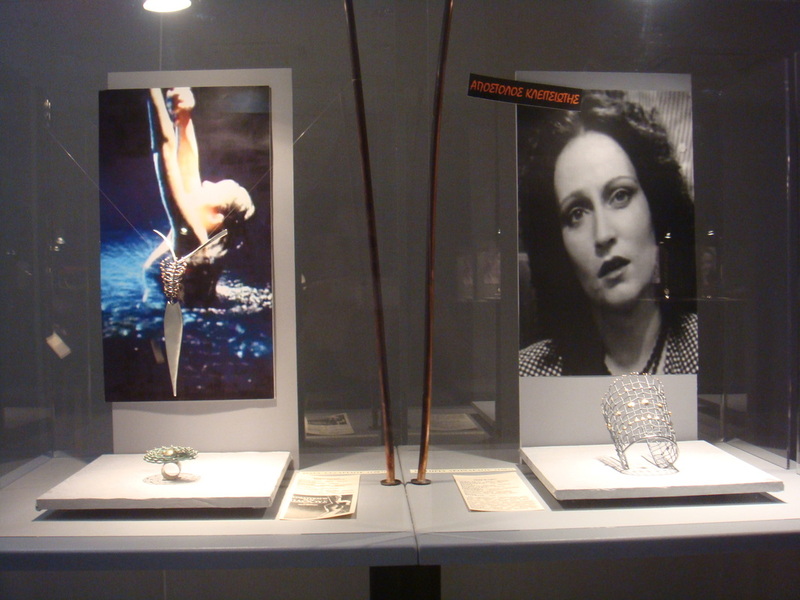 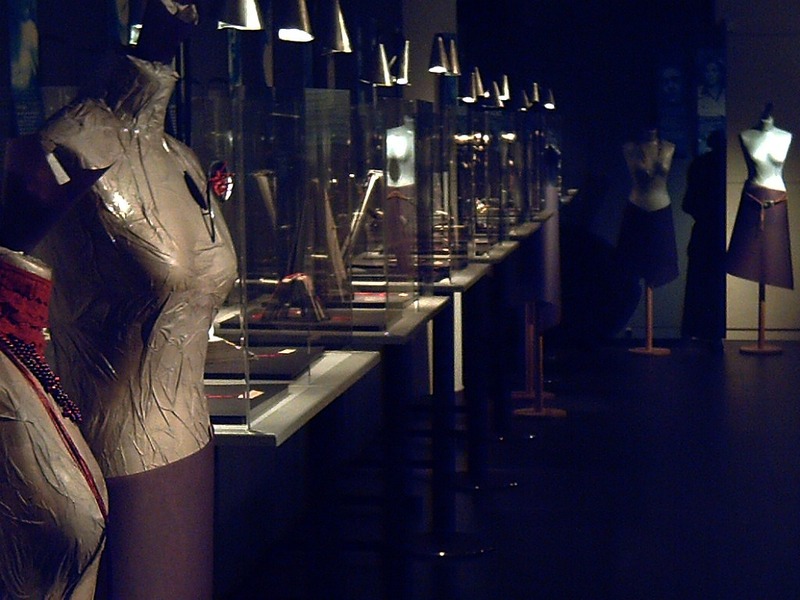 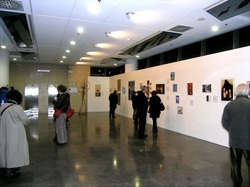 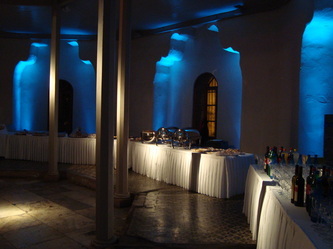 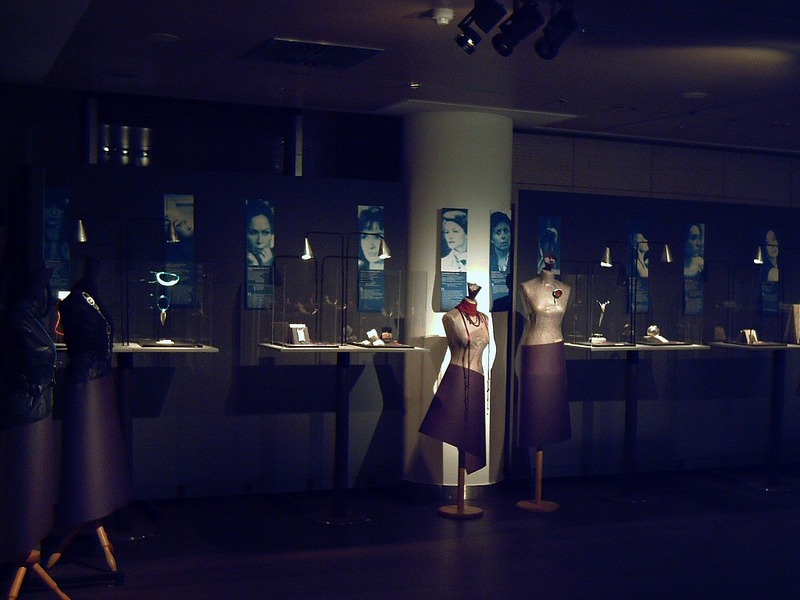 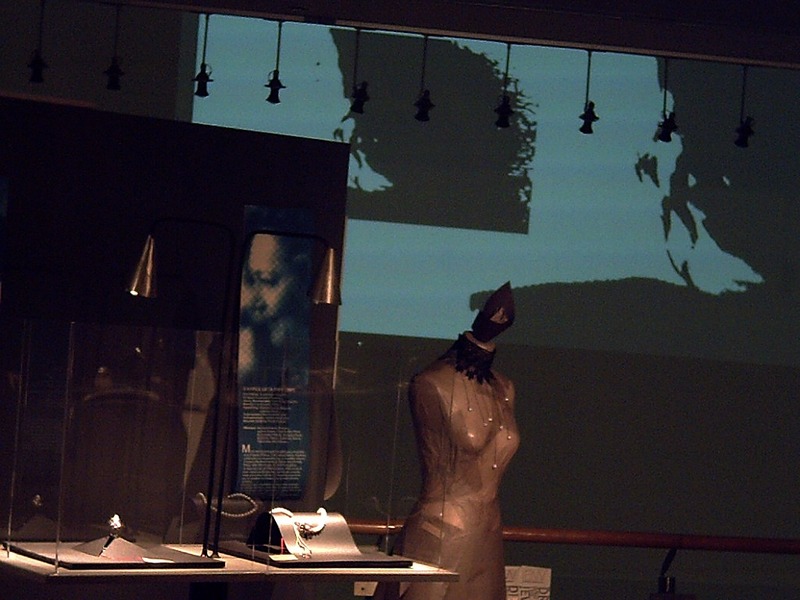 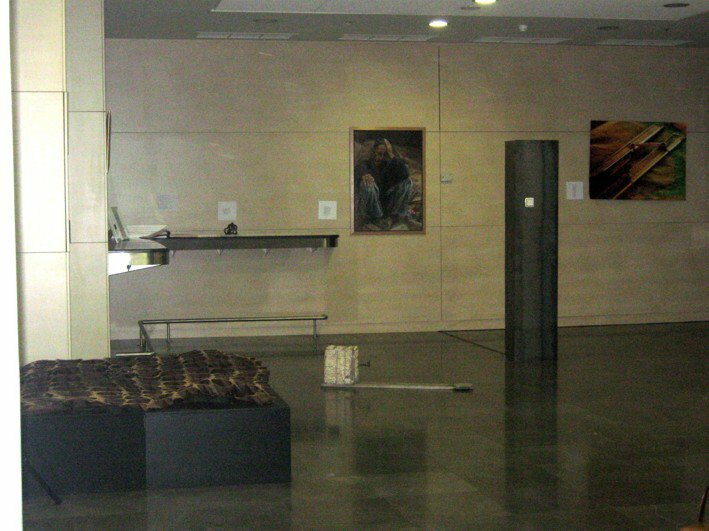 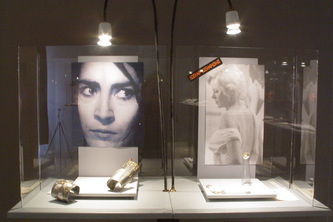 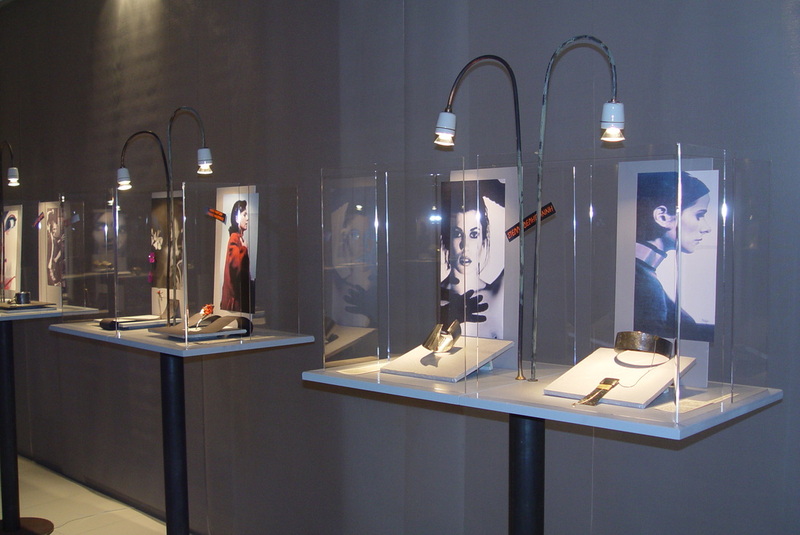 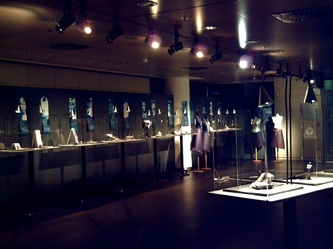 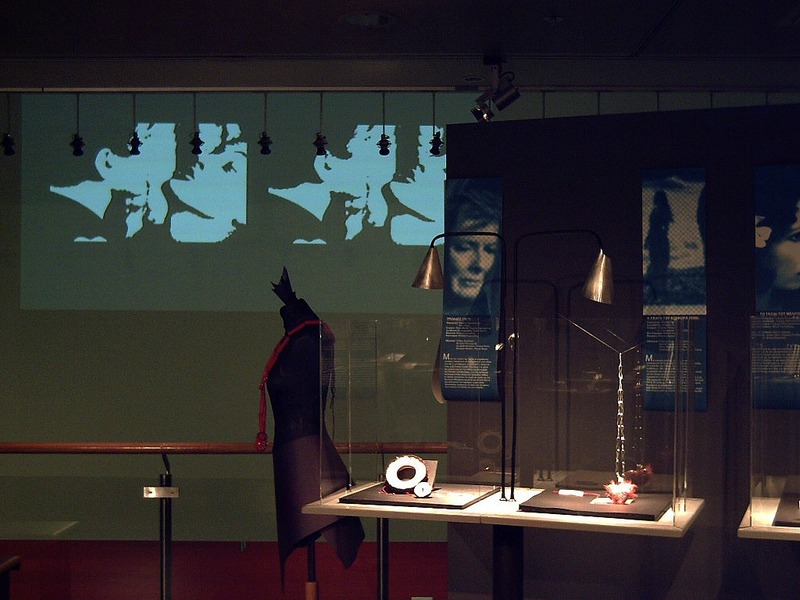 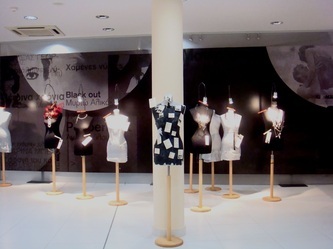 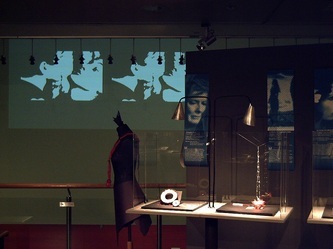 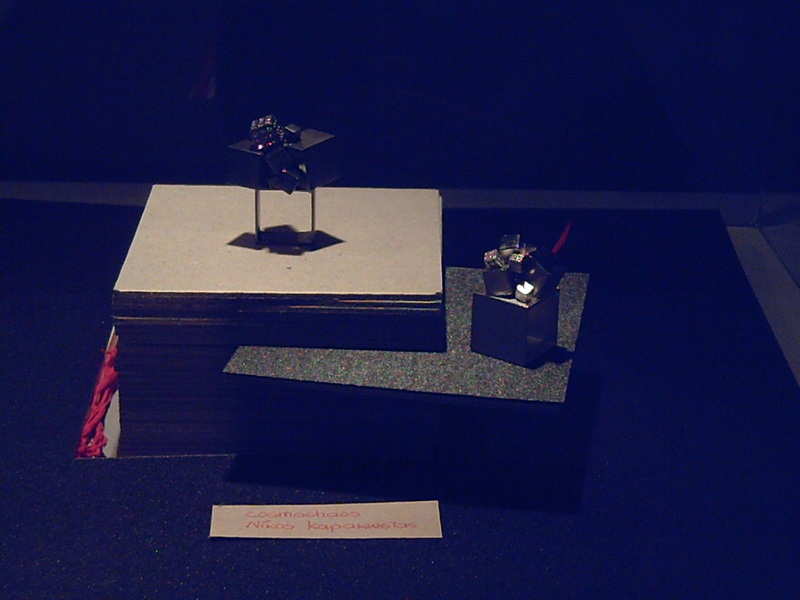 's exhibition that took place at 50th Film Festival of Thessaloniki . 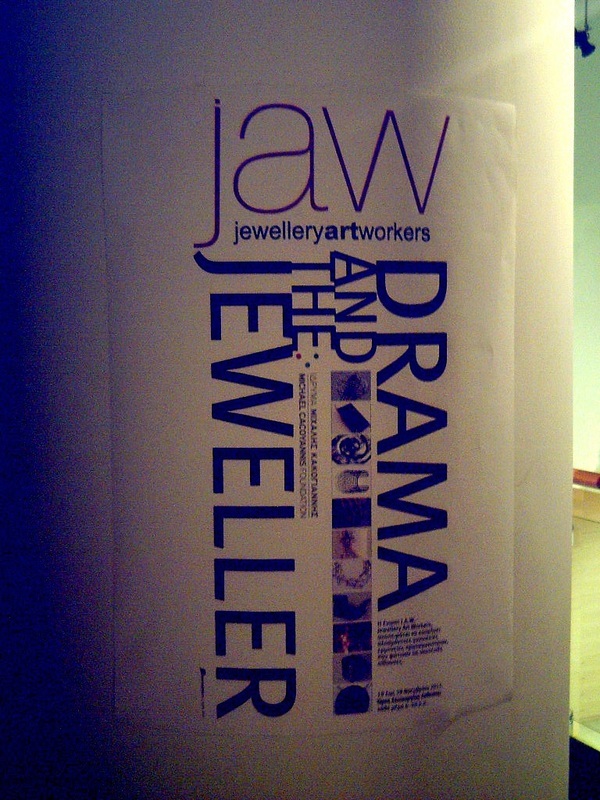 This time Jewellery designers of J.A.W. 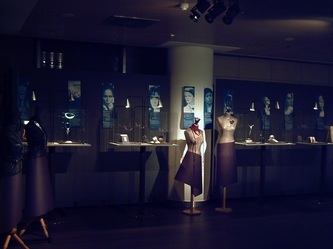 group got the inspiration from 50 award winning actresses and their film roles. 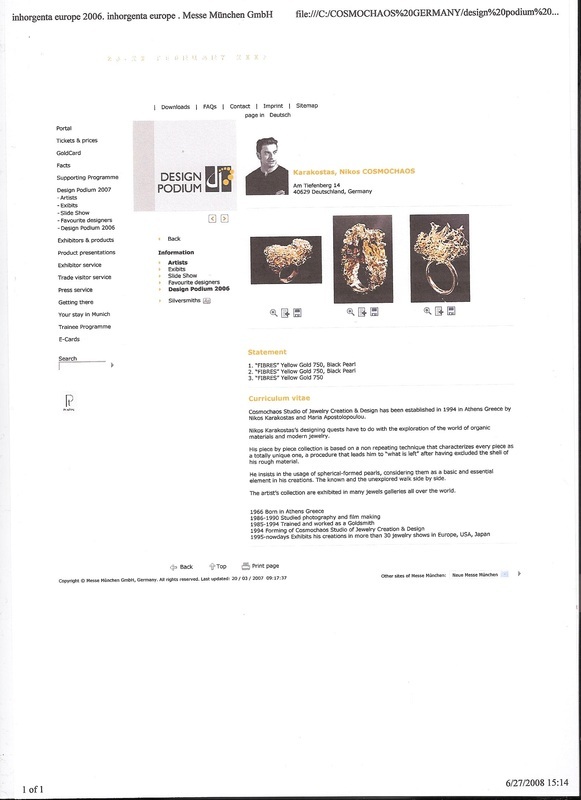 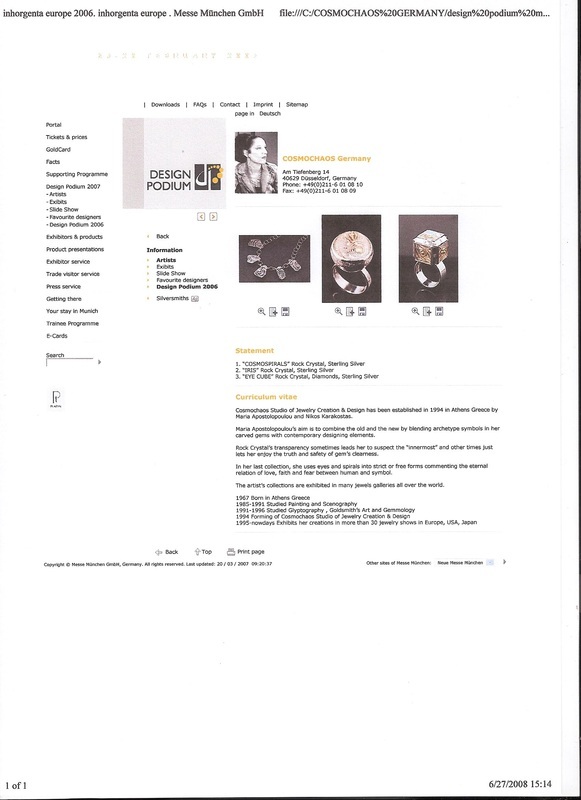 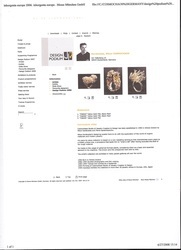 Design Podium is an institution for jewellery designers that is held annualy within Inhorgernta International jewellery fair in Munich. 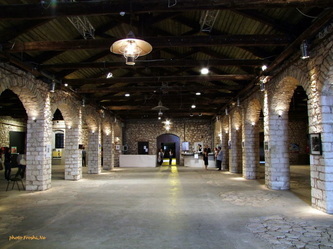 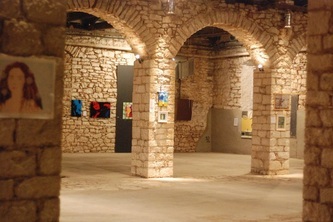 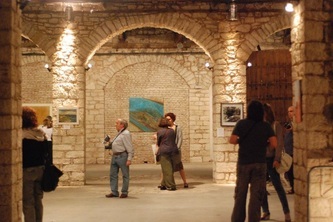 ART EXHIBITION BY "EVENT ORIZON"
The known group of artists 'Event Horizon' exhibite under the theme "Visual Poetry -part 2", at the old winery of "Ahaia Claus" at the city of Patras, in May 2010. 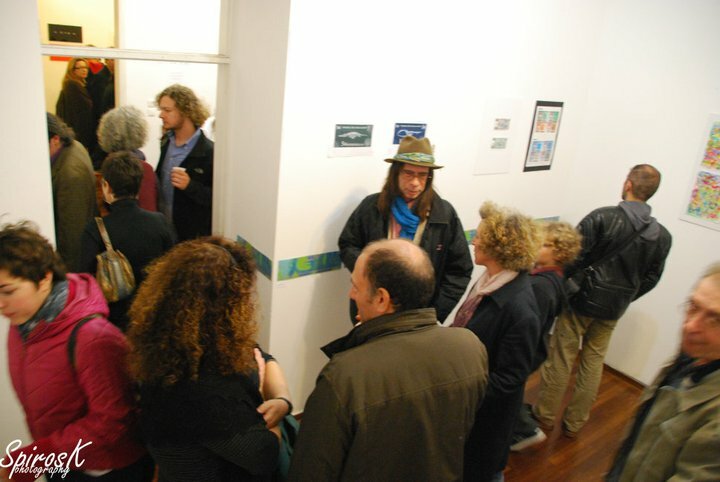 Thirty visual artists are inspired by poetry, giving to the public the opportunity to explore the close relation between these two art forms. 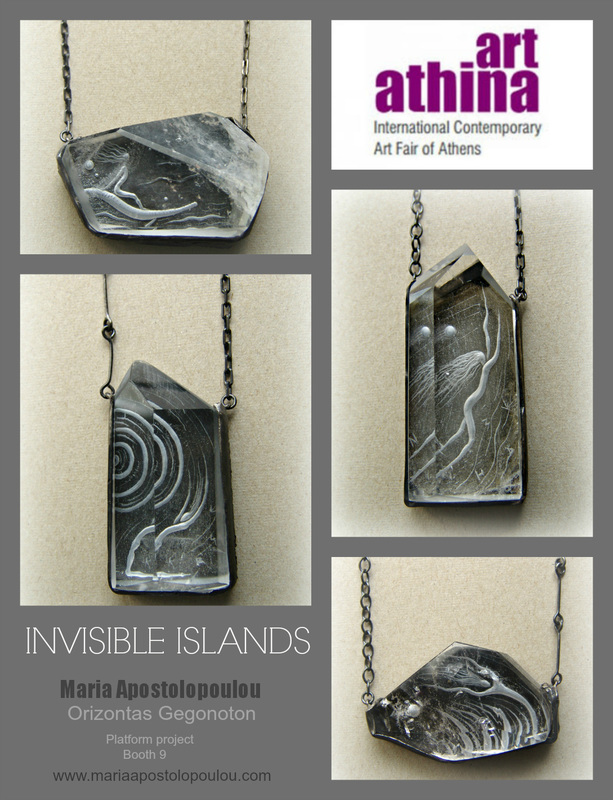 Maria's Apostolopoulou painting for "Visual Poetry-part 2" project.The art work is based on Arthur's Rinbaud homonymous poem . 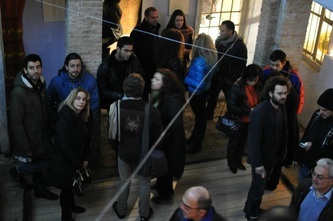 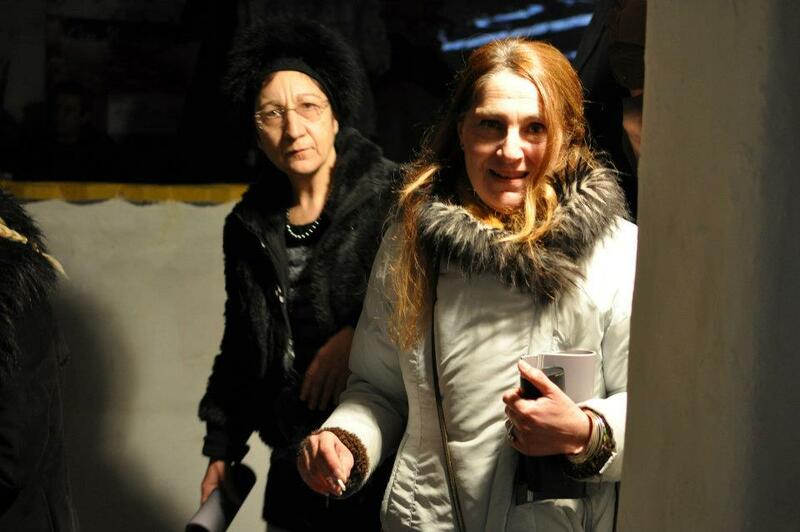 Art exhibition by "Event Horizon"
"Visual Poetry -part 3" takes place at "Michalis Kakogianis Foundation" in Athens . 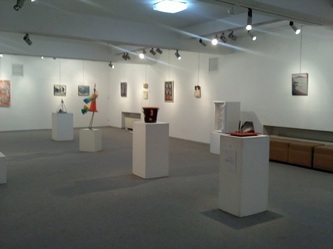 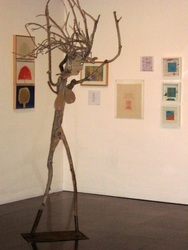 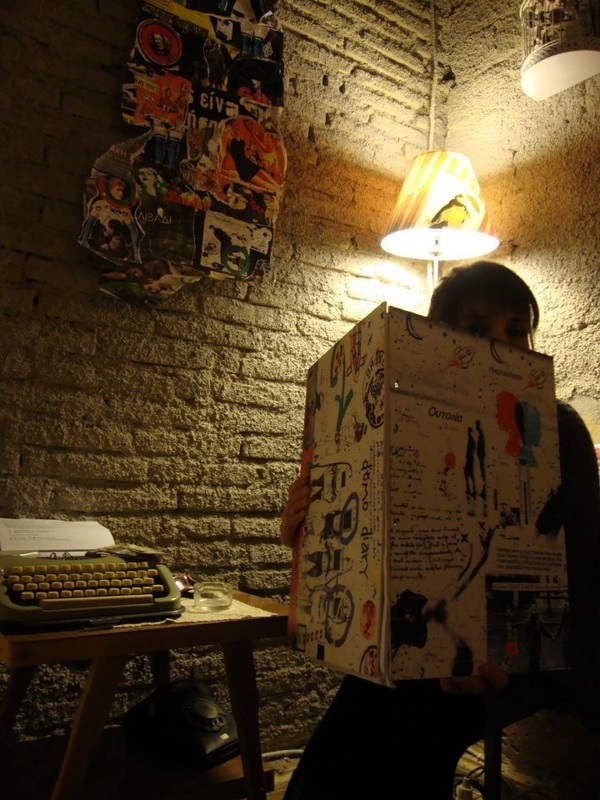 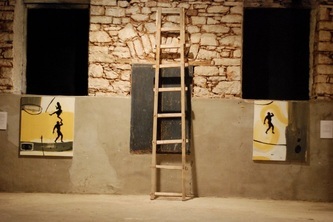 Painting, sculpture,theatrical events and poetry came together for fifteen days in May 2011. 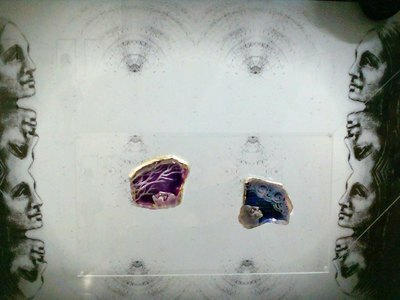 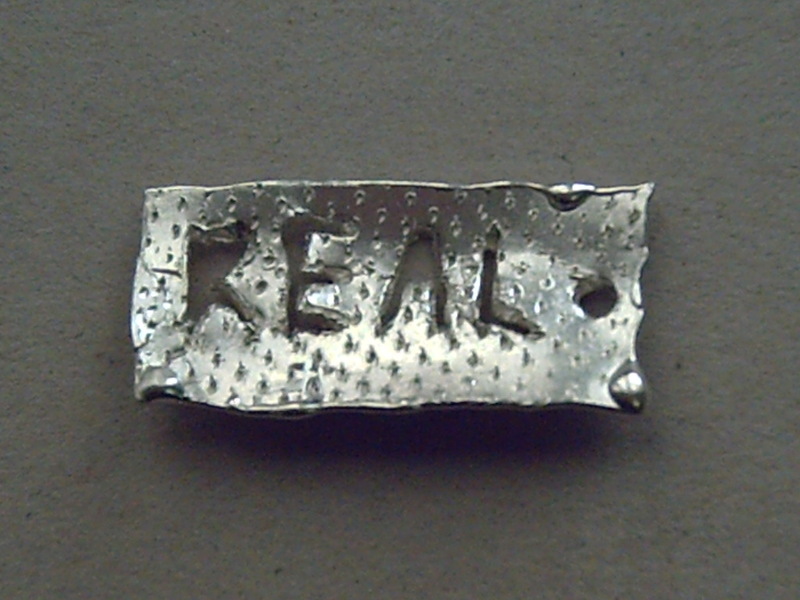 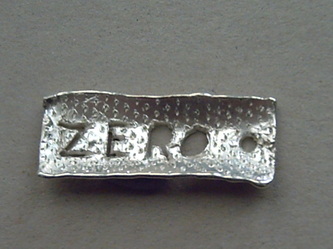 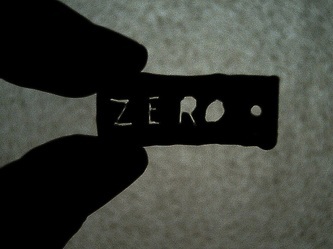 "ΙΝ ΤΗΕ SKY OF NOTHING HAVING THE MINIMUM"
Sculptural synthesis for "Poetry Visualization-part 3"
"ART BANK" - Artists create and exhibit their own artistic currency .I participate with my silver coins. 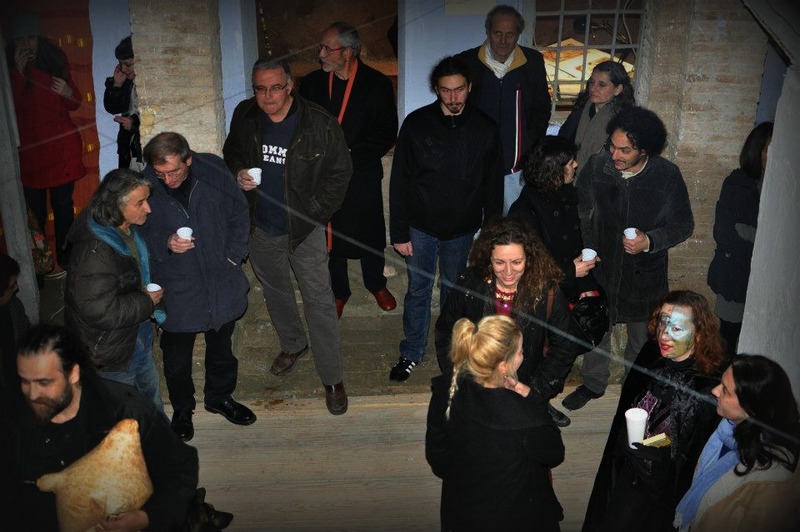 A performance about the economical crisis in Greece will take place at the opening at EPASKT's old building in Plaka, Athens . 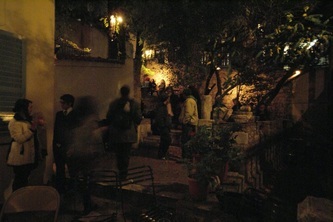 The opening night will close with a big party in the yard. I exhibit at "IS THIS ART ?" 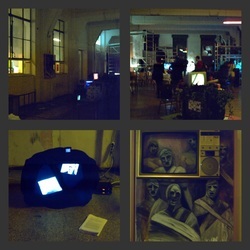 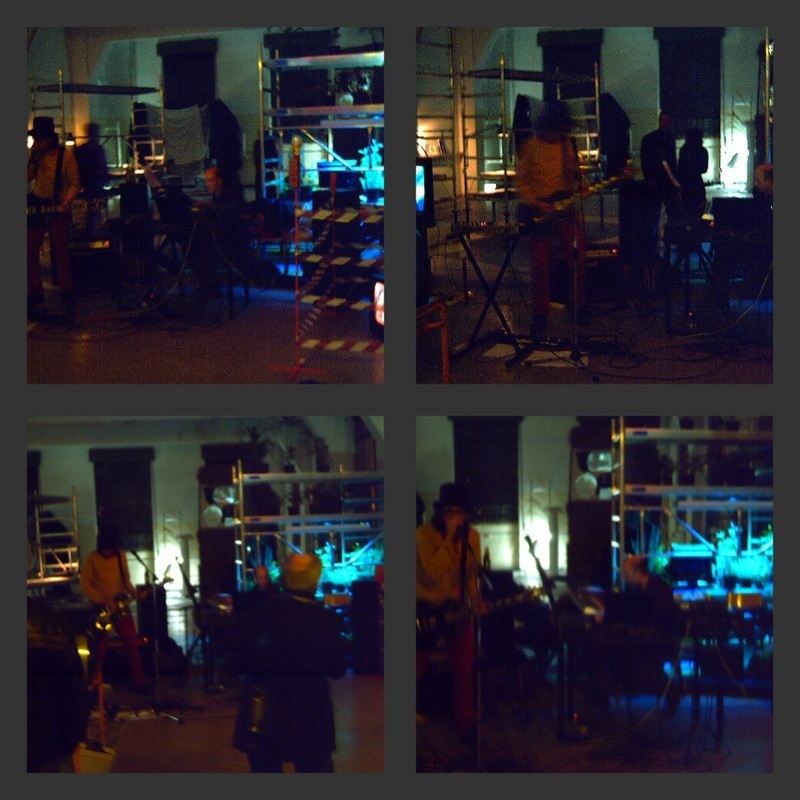 , the new art project of EVENT HORIZON. 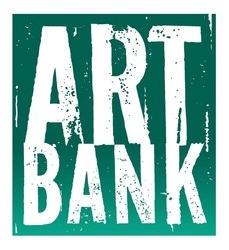 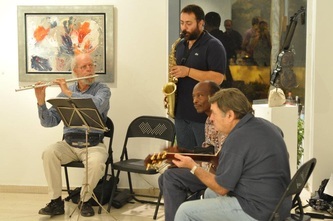 , where artists are called to treat the boundaries of art. 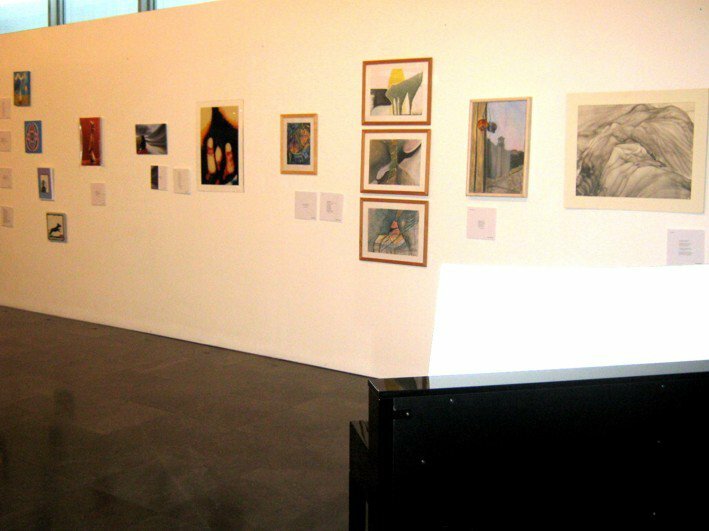 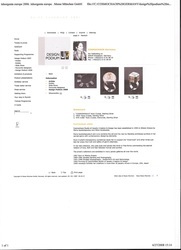 The exhibition programme contains a series of lectures about the definition of art and a big music concert as a parallel event.